Because this space is usually at the core of a welcoming and comfortable home, the living room decor has to be just right. This is where family members spend time together, where friends gather to chat and play board games, where one can relax and watch a movie. Not everyone has the same ideas when it comes to what function this space should fulfill and not all living rooms are the same. In fact, each one is different in its own way, featuring elements which make it special and unique. 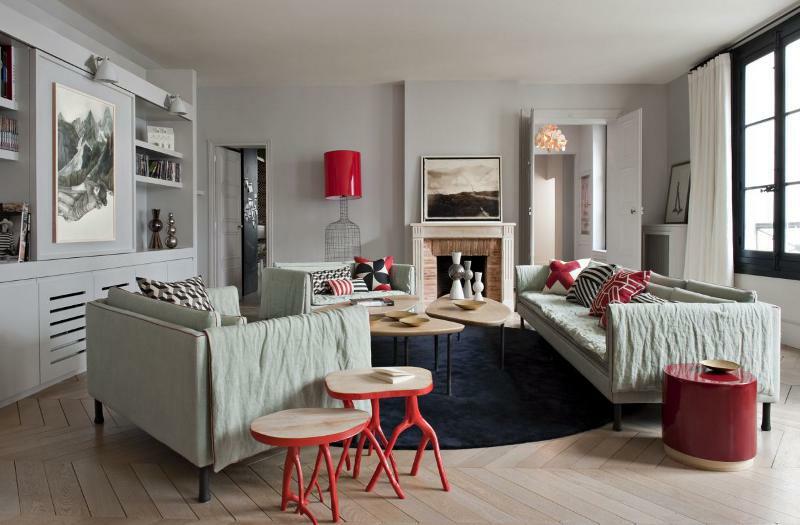 Finding a suitable design strategy for a living room takes time. Let’s say you want your small living room to appear larger and more spacious. There are plenty of possibilities you could adopt. Using large mirrors is one of them. Another strategy is to emphasize the height of the room. Having a living room with a double height ceiling is definitely an advantage in this case. You can further highlight that by displaying long curtains and a low hanging chandelier or pendant lamp. Arent & Pike had the right idea when designing this space. The size and shape of the windows also counts. A living room with long windows that go almost from floor to ceiling will definitely look bright and open. To emphasize that, hang long curtains flush with the ceiling. 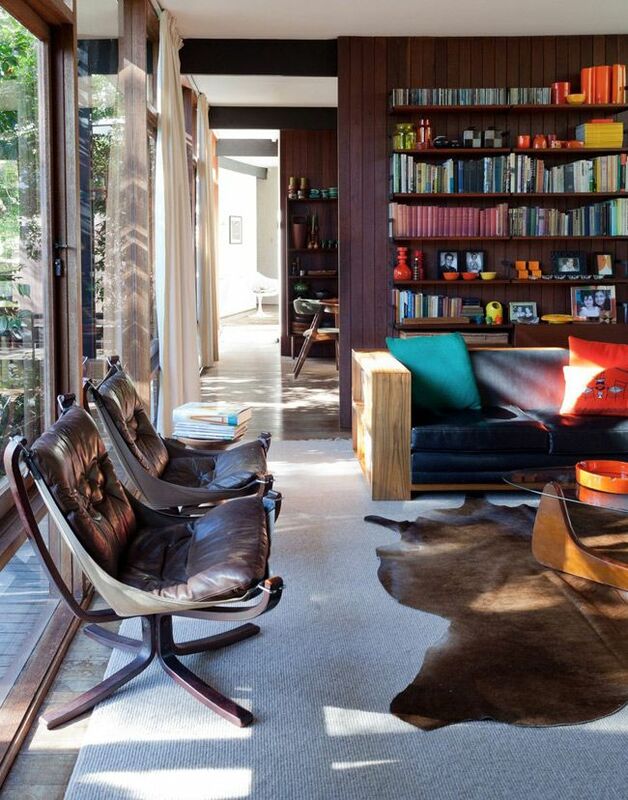 Interior designer Marianne Tiegen took maximum advantage of the windows in this case. In the case of a large living room, on the other hand, things are different. Everything is on a different scale here. A large sofa or sectional can be comfortably placed at the center of the room, being complemented by additional accent chairs or even by a separate lounge space with its own distinct character. 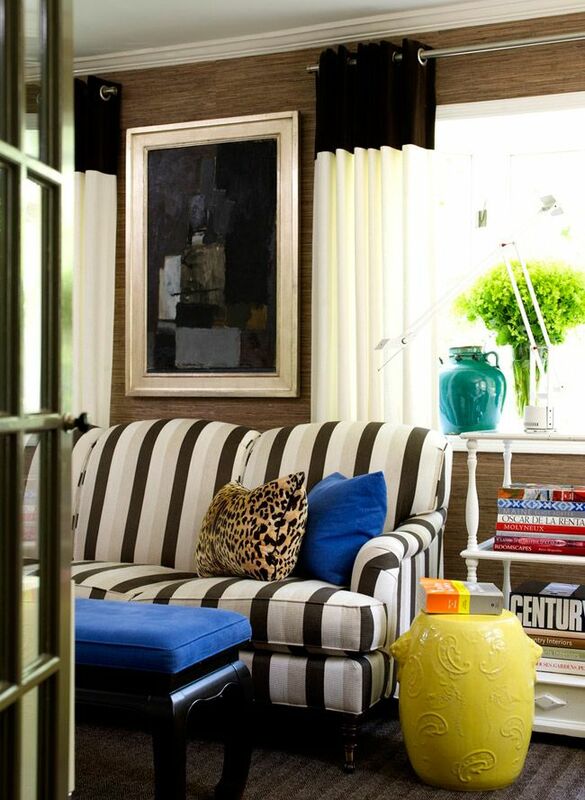 Stripes are often used to emphasize a room’s shape or to make a space appear larger or more spacious. 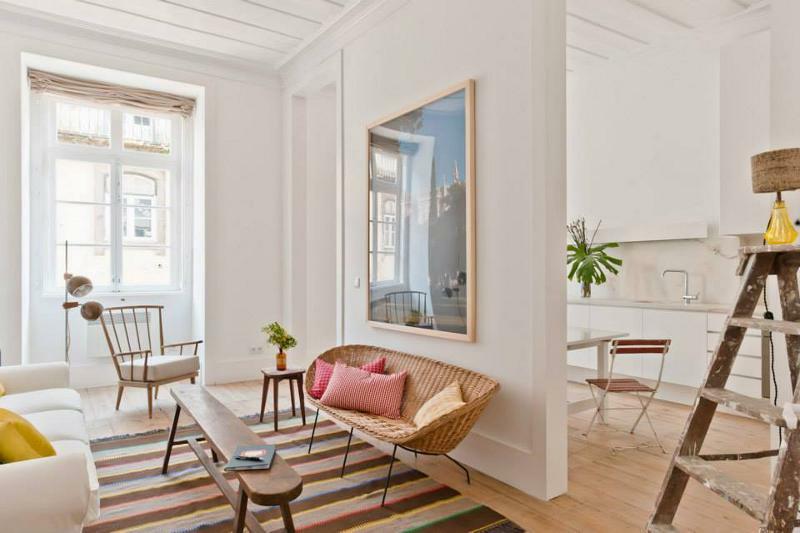 One of the strategies is to use a striped area rug in a narrow living room in order to take advantage of its shape and layout instead of trying to conceal these elements, perceiving them as disadvantages. The team at Disc Interiors offers a great example here. It’s common for living rooms to include staircases leading to a loft space of a different level. When the living room is large and spacious, integrating a sculptural staircase in its design is not a problem. However, when the space is small, other strategies must be found. Interior designer Lorenzo Castillo chose a compact spiral staircase for this project, a wise and practical idea. 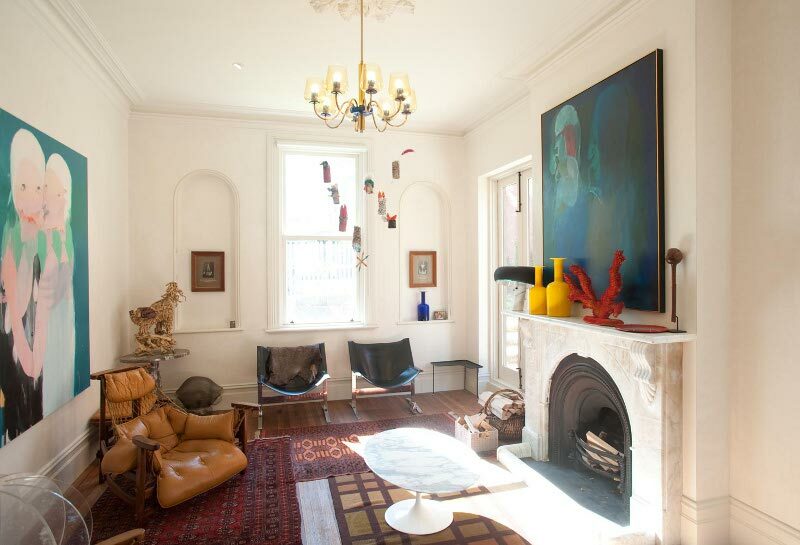 Another beautiful strategy is to take advantage of the home’s original architecture and design. When decorating a living room, for example, one can choose to explore the ceiling beams if there are any or to highlight an arched door or window, just like Wendy Haworth did when designing this elegant living room infused with mid-century style. 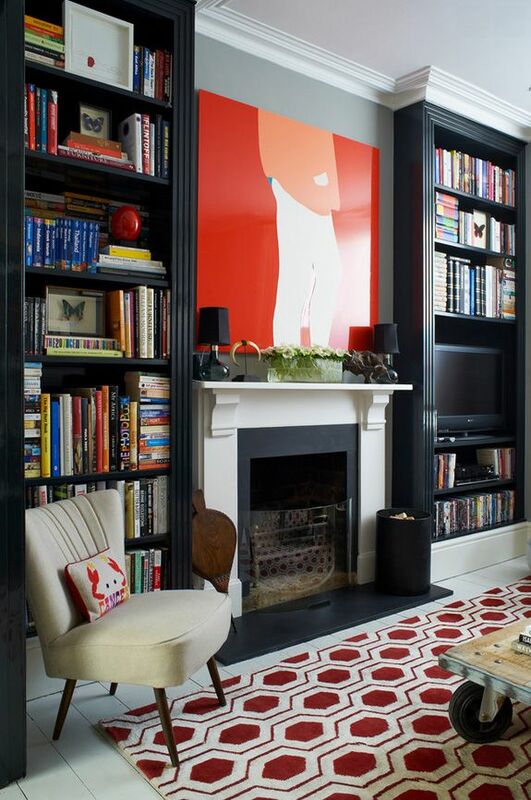 Mixing and matching styles is also important when coming up with an original design approach for a living room. 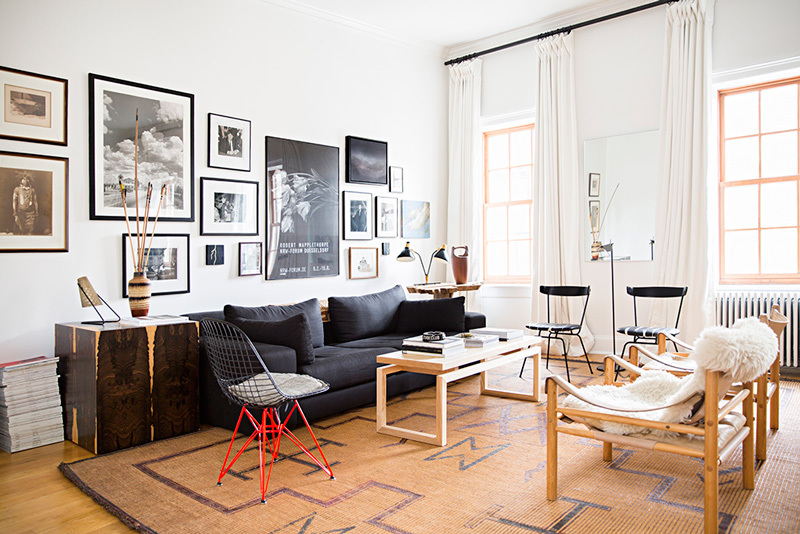 A modern space can feature vintage influences. Similarly, a living room can also be defined by industrial elements spread throughout its surface. Each living room has its own layout and the interior design has to be adapted to it. In most cases the coffee table sits at the center of the room. 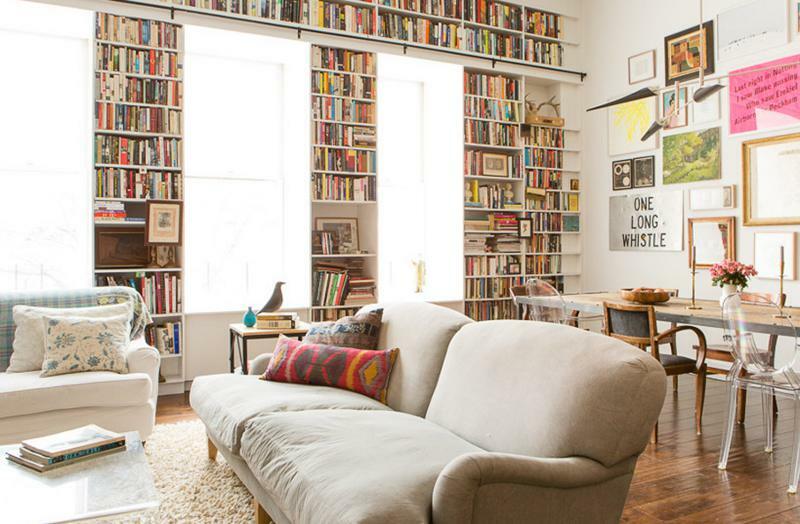 Sometimes the living room offers the perfect opportunity for creating a cozy reading corner. 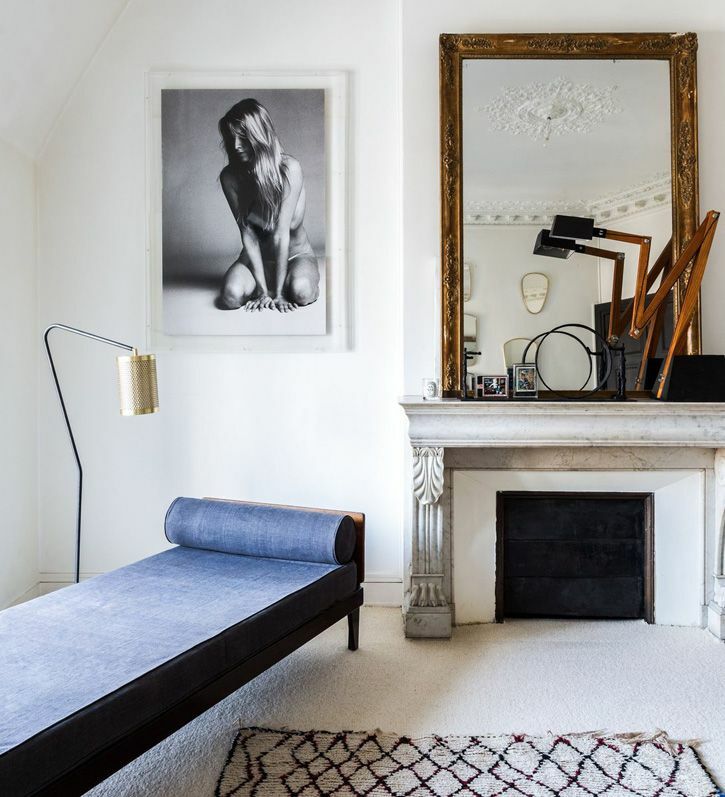 A comfortable armchair and a floor lamp can totally transform an empty corner. 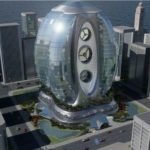 TomMarkHenry suggests that with this charming design. It’s amazing how much an area can impact a living room. The space often feels empty without one. 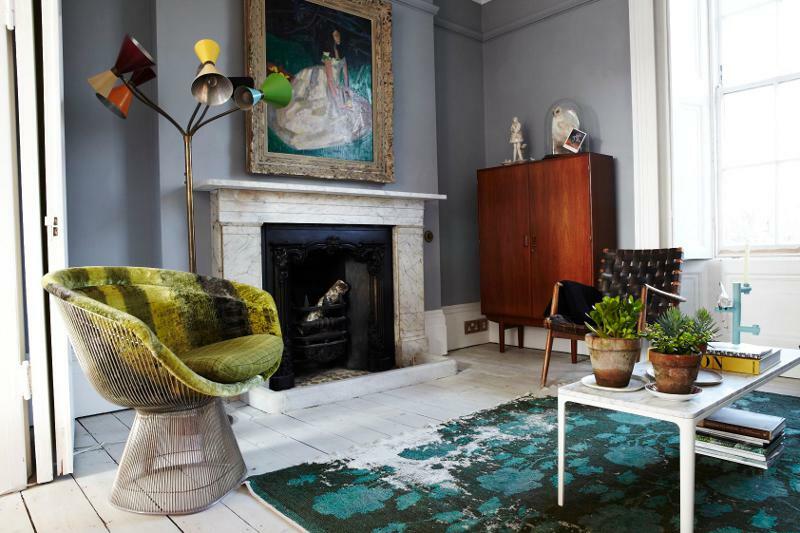 Of course, the type of rug, its color, print and the material from which its made also matter. 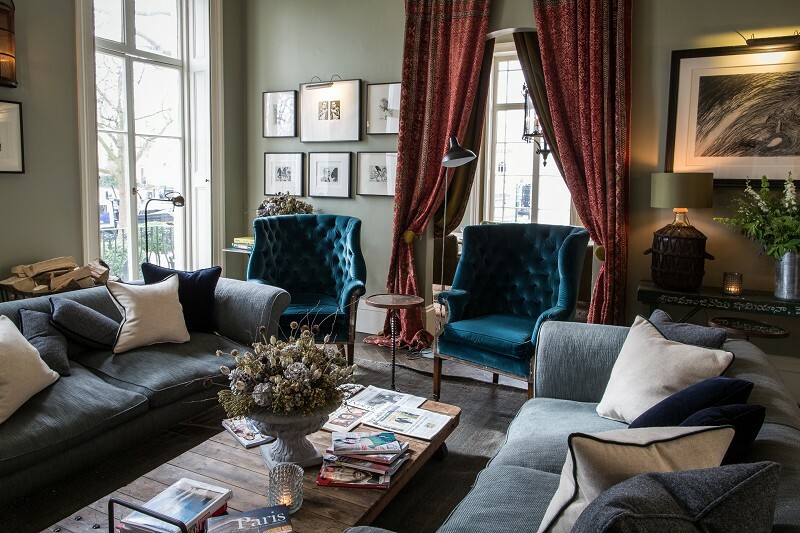 Check out beautifully the one chosen here by Sisalla Interior Design bring cohesion to the room. 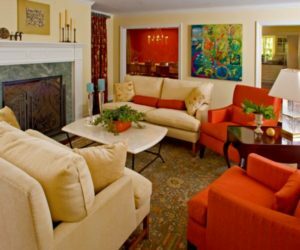 There are many ways in which to add color and texture to a living room. One option is to pick a simple sofa and to decorative with various accent pillows. Another strategy is to opt for a patterned rug which incorporates various eye-catching colors in its design. 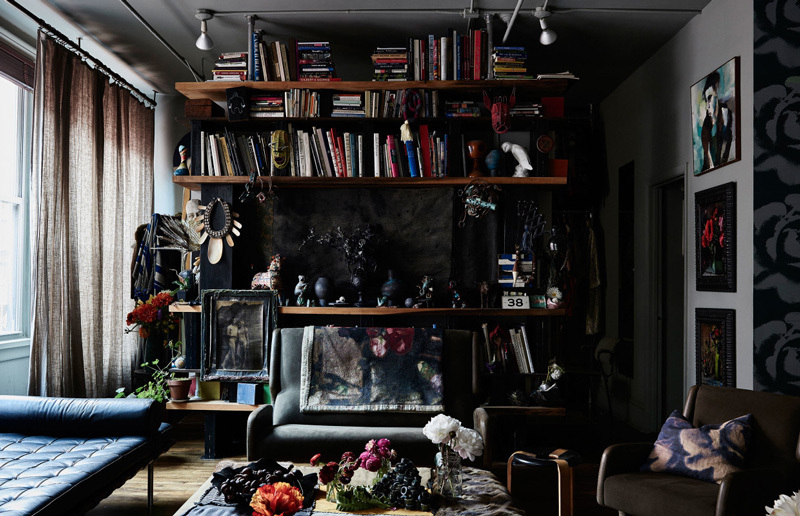 Either way, the rest of the décor should remain simple, just like in the case of this eclectic room designed by Tatiana Nicol. Nature-inspired interior designs are always inspiring and interesting. Finding inspiration in nature may seem like a simple task but things are more complicated than they seem. 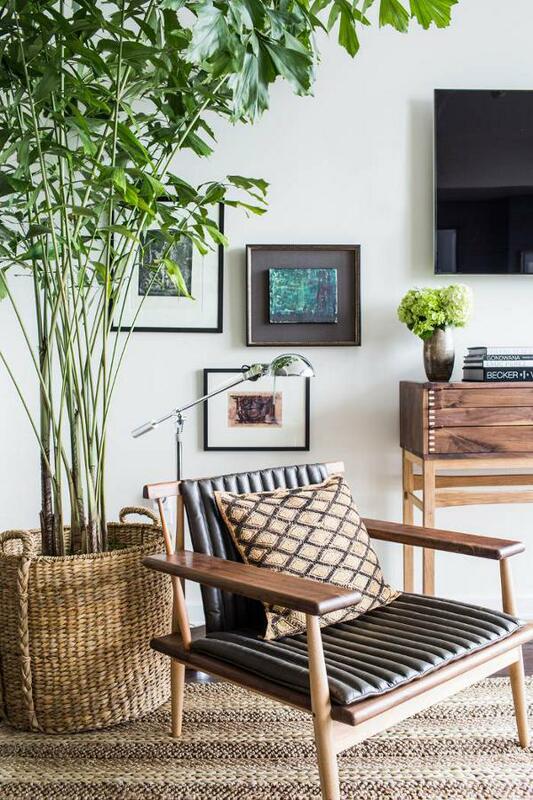 One can choose to include a variety of plants in the living room in order to get that look. This strategy was partially used here by Florence Lopez. If you want to keep a living room airy and bright, one of the strategies you can use includes simplistic furniture such as open shelves. You can mix these with a framed mirror to add depth to the décor. 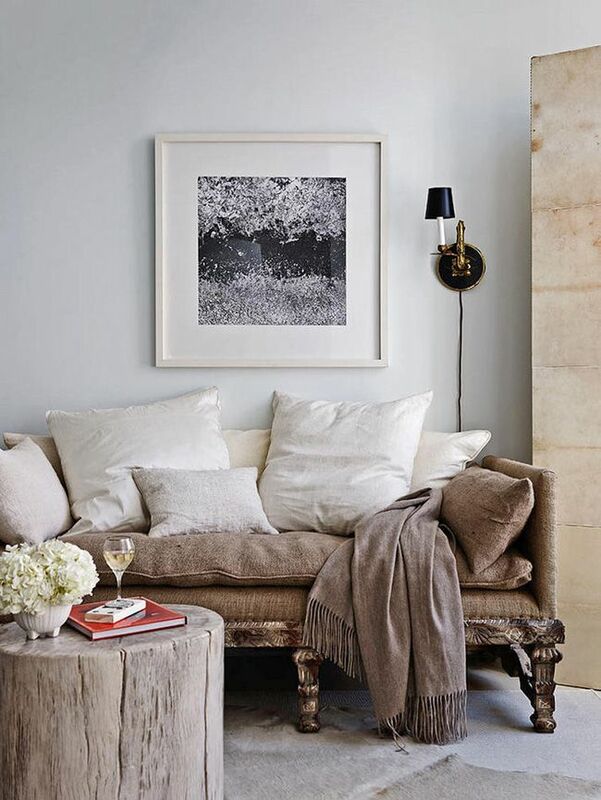 The color palette should stay neutral and focused on light tones. Martha Mulholland offers an inspiring example here. A double height living room offers numerous design possibilities. 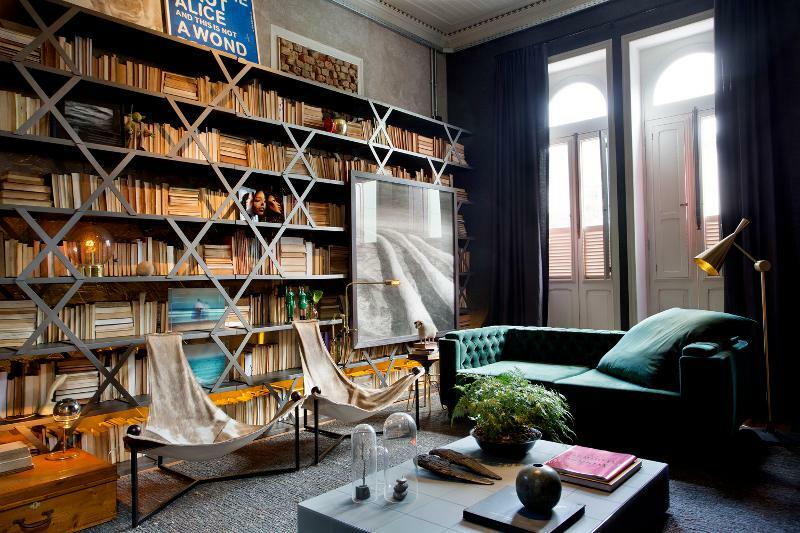 Studio Mellone chose in this case to give the space a large bookcase covering one of the walls. A mobile ladder offers access to the upper shelves. The fact that the room also has an entire wall of windows definitely adds to its charm and drama. Small living room furniture is best kept simple. Michael Dawkins introduces here a white-based design. This opens up the room. The white sofa, armchairs, coffee table, area rug and curtains are complemented by touches of stained wood and the occasion blue and green in the form of wall décor or natural plants. 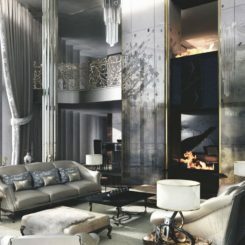 In order for a living room to look sophisticated, dramatic and luxurious, certain elements have to be included in its design. 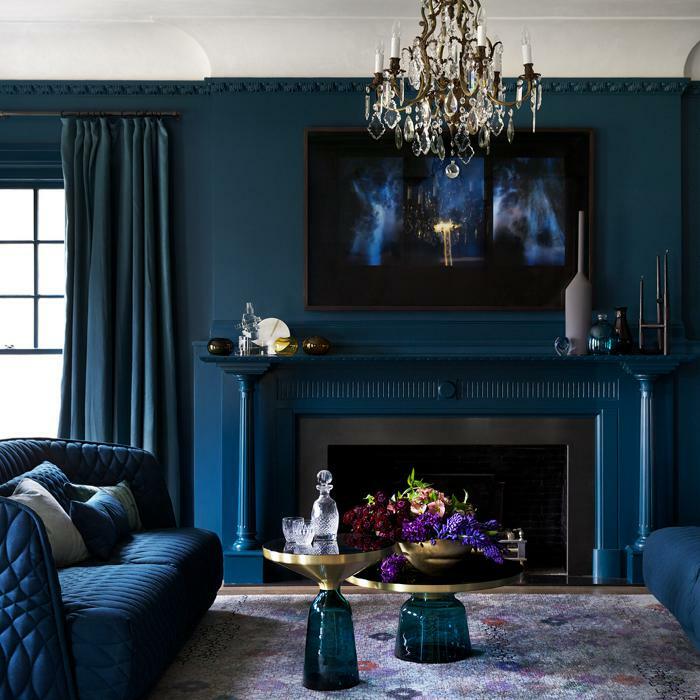 Rob Mills shows how a chromatic palette dominated by dark blue can have the desired effect. An ornate chandelier and a few touches of gold here and there complete the look. The idea of placing two identical sofas in the living room is definitely intriguing. This strategies involves a décor centered on social gatherings and interaction. Instead of the usual sectional facing a TV, the two sofas can face each other and can frame a fireplace. The design created by Courtney Bishop also adds symmetry to the mix. 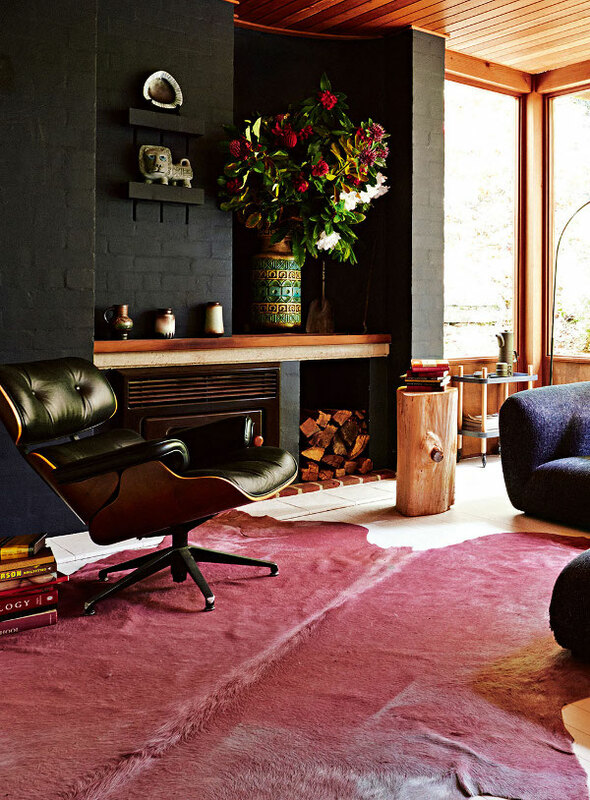 A living room can be sumptuous in more than one way. The colors chosen for its interior design play an important role. 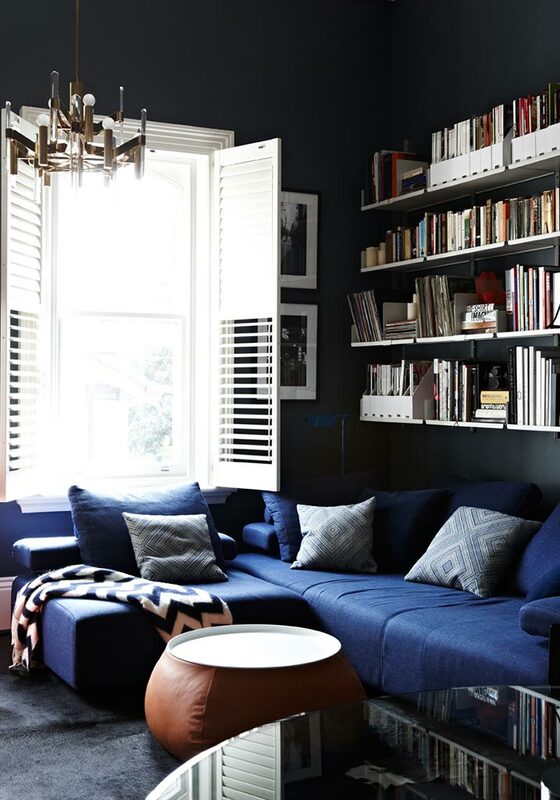 Shades like dark blue, purple or burgundy can have the desired effect. Texture is also important. 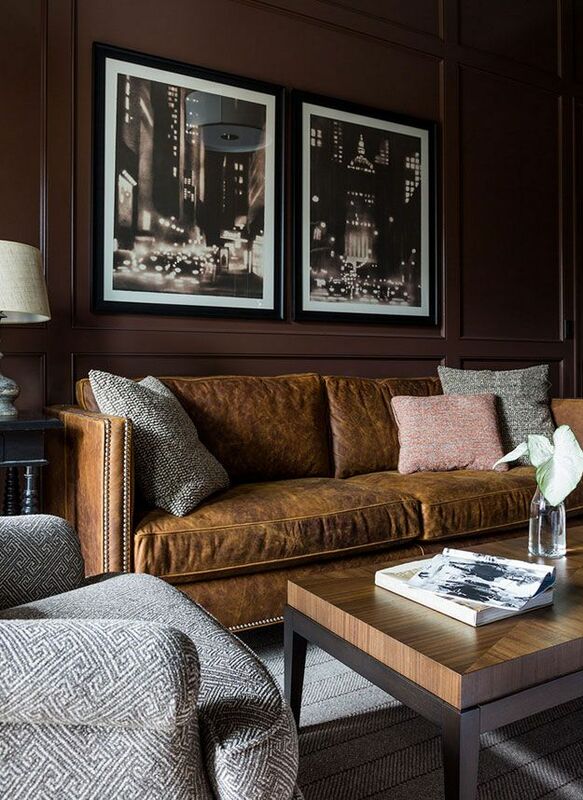 Velvety fabrics can instantly impact the décor. The right accent details and the lighting also matter. 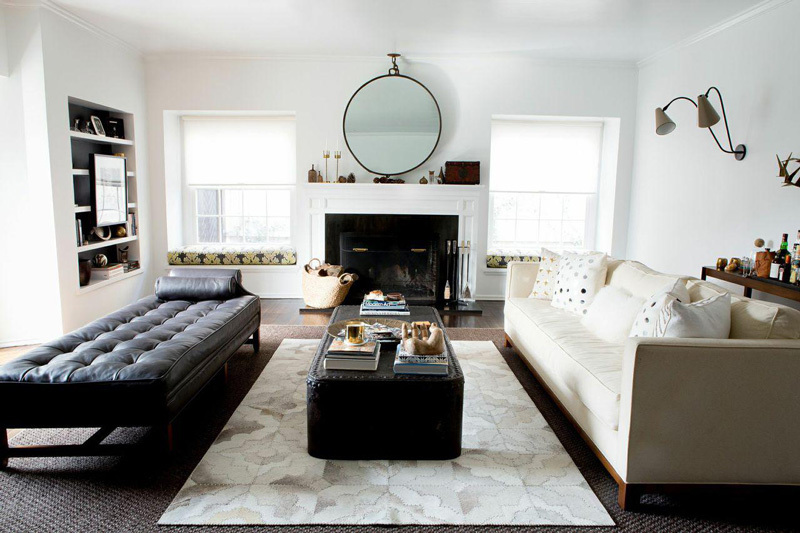 Kara Mann made sure that this living room is both casual and elegant. This is space where one can feel comfortable, being surrounded by light colors, comfortable furniture and a traditional fireplace. The design also integrates elements such as two flexible and sleek floor lamps and a combination of side tables which give the space a subtle vintage-industrial charm. 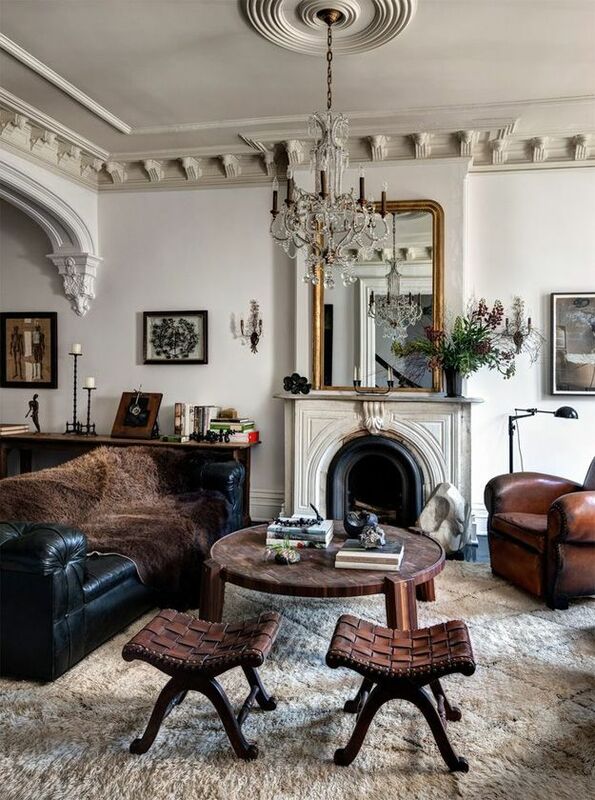 The arched ceiling design gives this living room a particularly interesting look. The room’s sculptural beauty is also emphasized by a graphical light fixture and a collection of furniture pieces each with its own unique characteristics and individuality. The color palette is diverse but balanced. 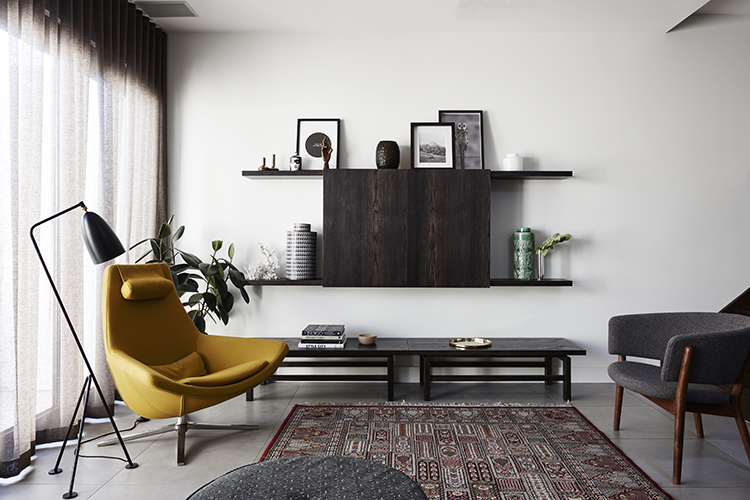 Modern and contemporary living rooms often choose to explore the beauty of raw materials and include concrete walls and floors mixed with warm wood elements for a balanced and welcoming ambiance throughout. They also often feature bold focal points similar to these abstract art pieces in this case. 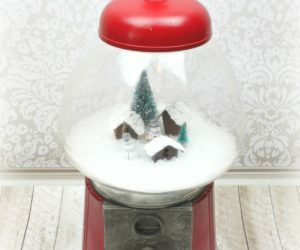 Different colors have different impacts and effects on a décor and, when combined with the right forms, textures and designs, they can each impress. Light blue is known to create a soothing and relaxed atmosphere. SJB used it as one of several accent colors which are brought together in the form of an abstract painting. 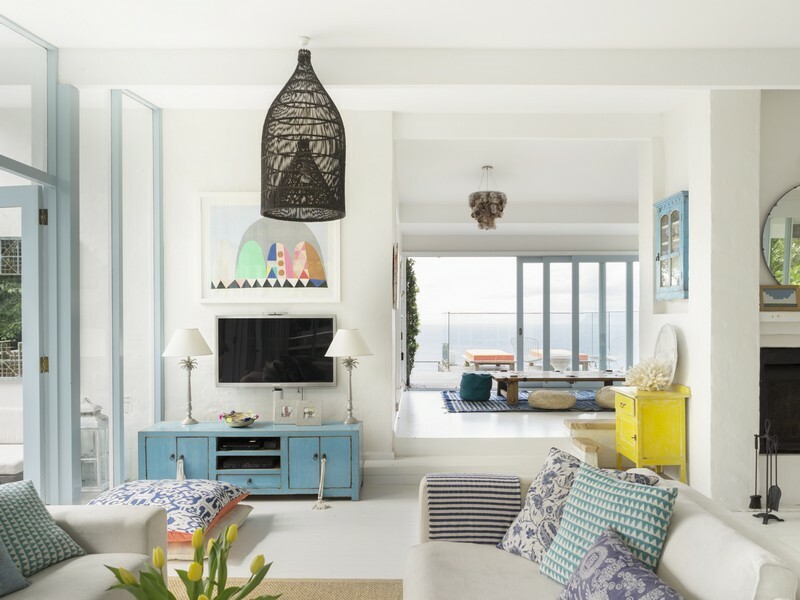 A casual living room is often defined by the presence of lightweight furniture, simple and bright colors and the use of simple patterns and forms. The lack of big and robust pieces of furniture allow the décor to look fresh and airy while everything else makes the room look particularly comfortable. The ceiling is often overlooked. We focus so much on the furniture and the wall décor that we forget about this large surface which can easily become a focal point for the living room. 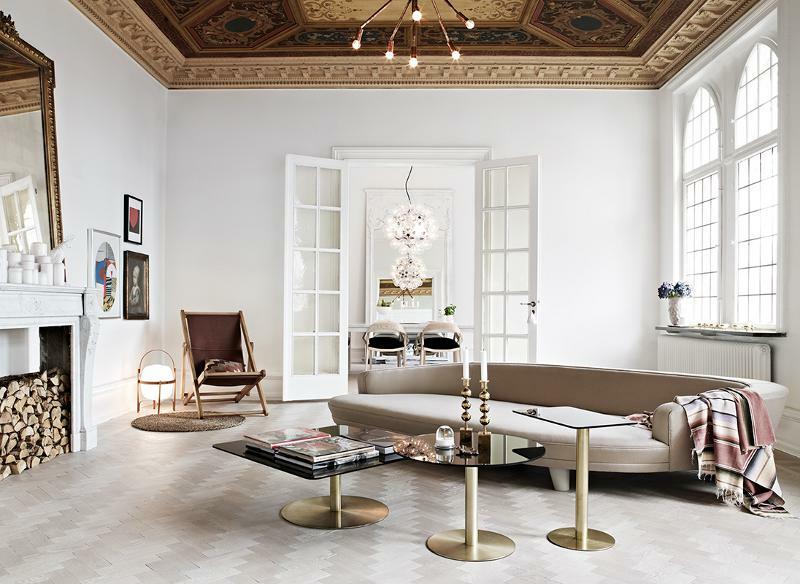 There are numerous ways in which to make the most of a ceiling either by using sculptural molding, bold colors, wallpaper or by playing with contrasts. Certain combinations of colors and materials are known to send a particular message. For example, black mixed with gold is elegant and royal. 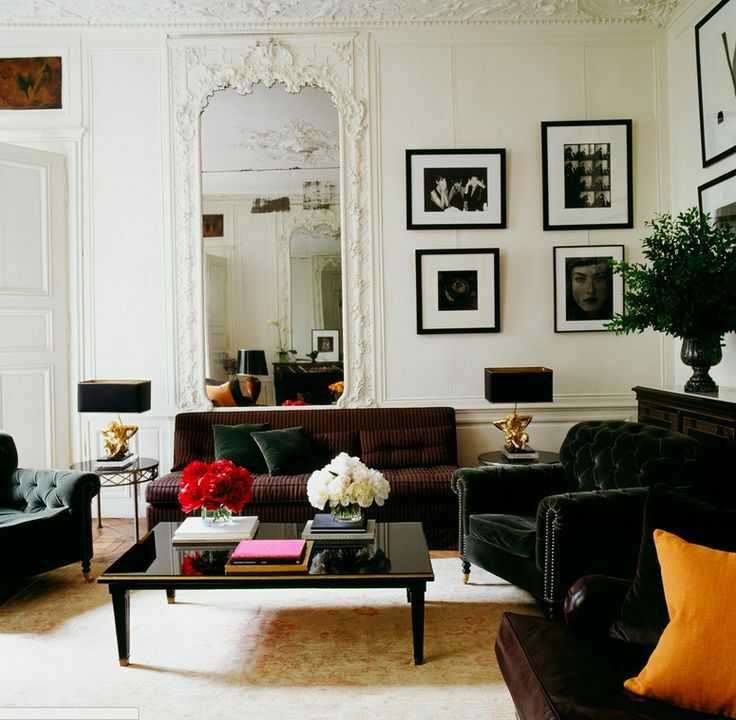 So consider giving your living room black walls and decorating them with gold-framed artwork. 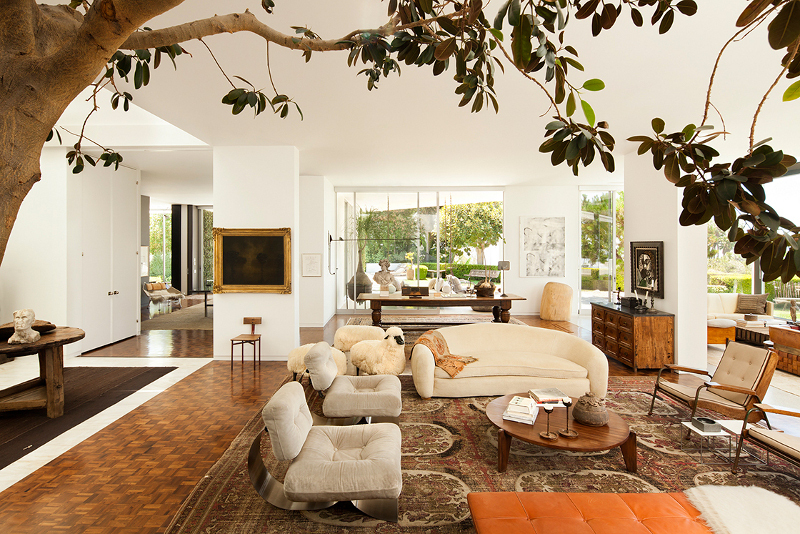 Ever considered bringing an actual tree into your living room? 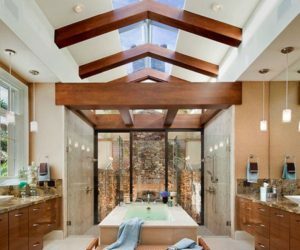 Clements Design can show you how such a décor could look like. 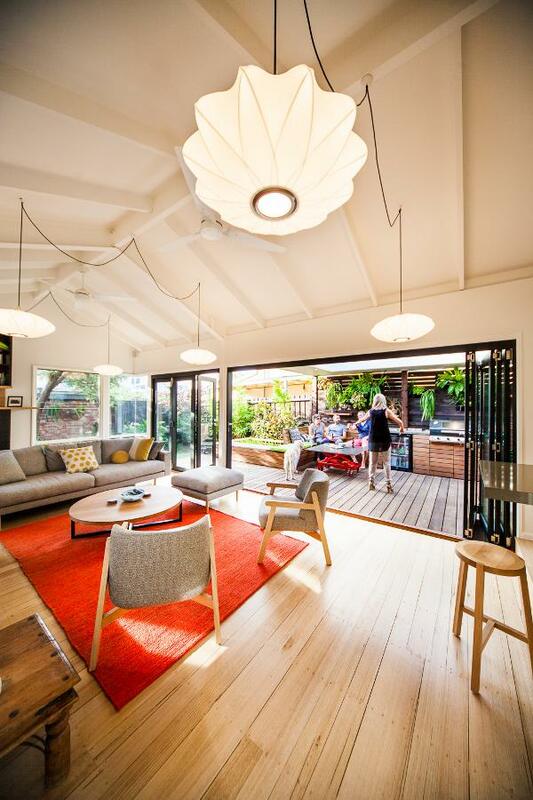 There are also cases when living rooms are built around large trees existent on the site. In both cases, the interior design is unique and nature-oriented. 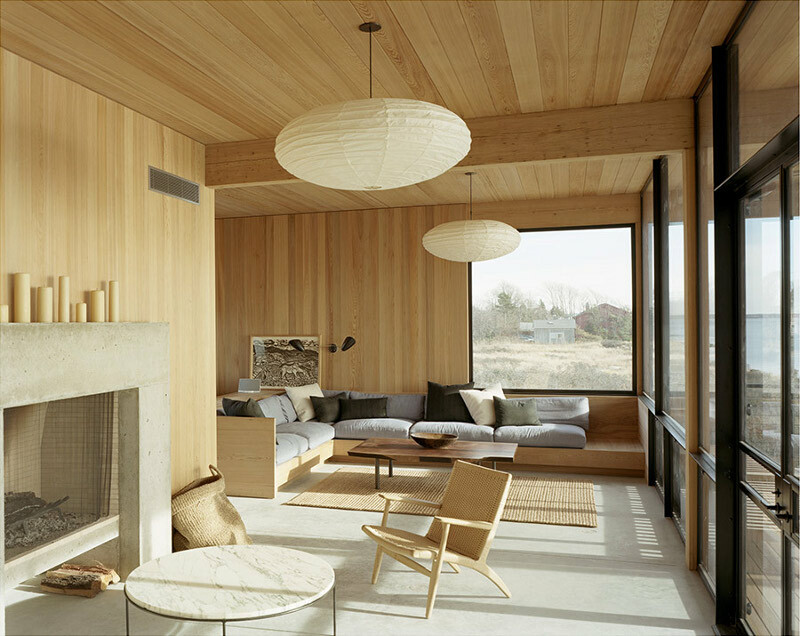 This living room designed by Meyer Davis has natural light coming in from all sides. Being exposed to the outdoors like this allows the space to share a strong connection with its surroundings and to always feel welcoming. The fact that an imposing fireplace serves as a focal point also has a similar impact on the atmosphere inside. 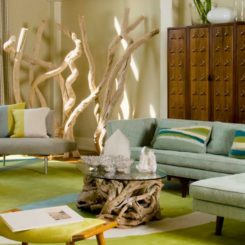 Bringing natural elements into a living room is a strategy which can be applied to all styles. 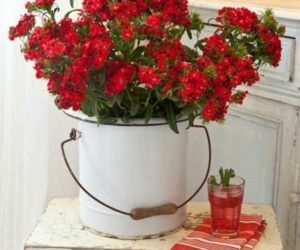 Hess Hown chose here to use potted plants are decorations meant to give the room a fresh feel and to also add some color to its décor. 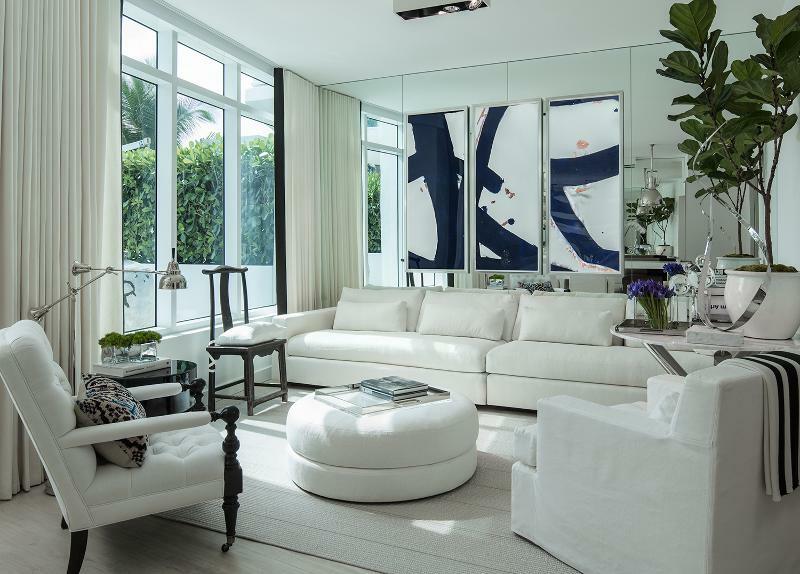 The white palette would be monotonous without a few contrasting details. The birds suspended from the ceiling are definitely the most eye-catching design feature in the case of the living room designed by P&T Interiors. As you can see, this is also a nature-inspired décor but the focus in this case is not on greenery. However, the full height windows take care of that part as well. 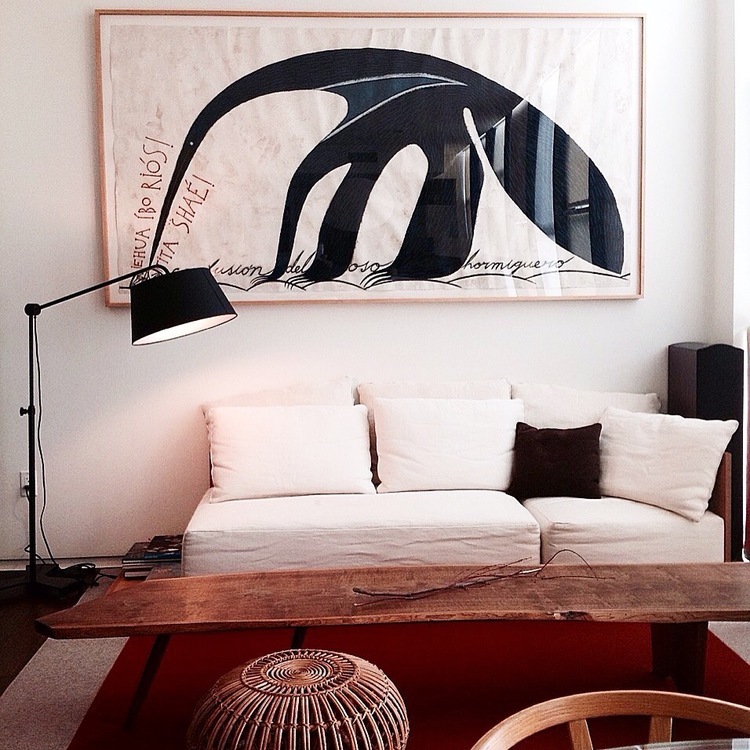 A large piece of artwork can wonderfully bring together all other elements in a living room. 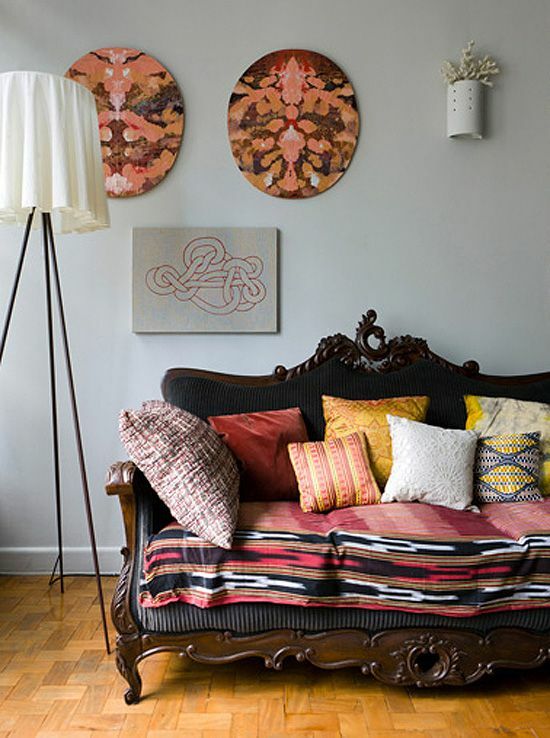 The design featured here by Maria Llado is very graphical and bohemian. 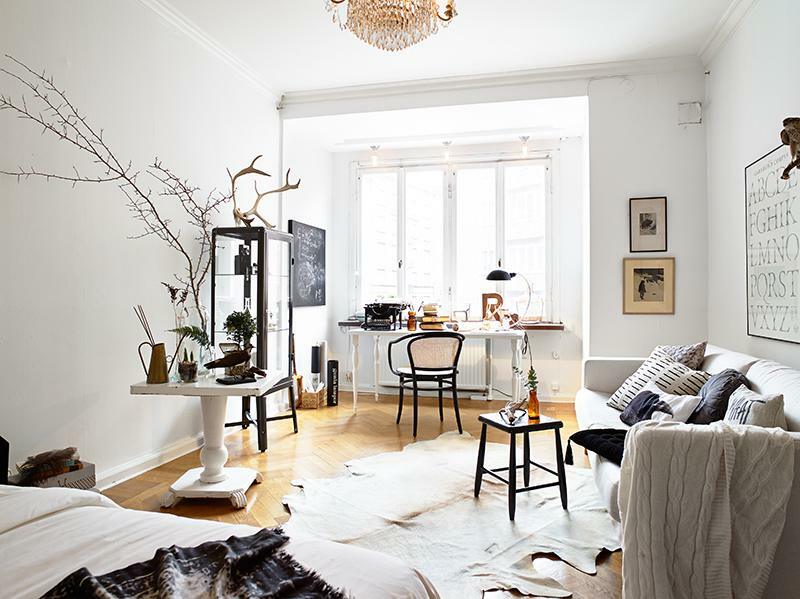 The space looks very elegant and chic and is at the same time very simplistic, cozy and casual. The mixture of accent colors is refreshing. A living room can be expanded by being linked to an adjacent balcony, provided that space is protected and not open. The wall between them can be removed, allowing light to freely flow through and adding more floor space. 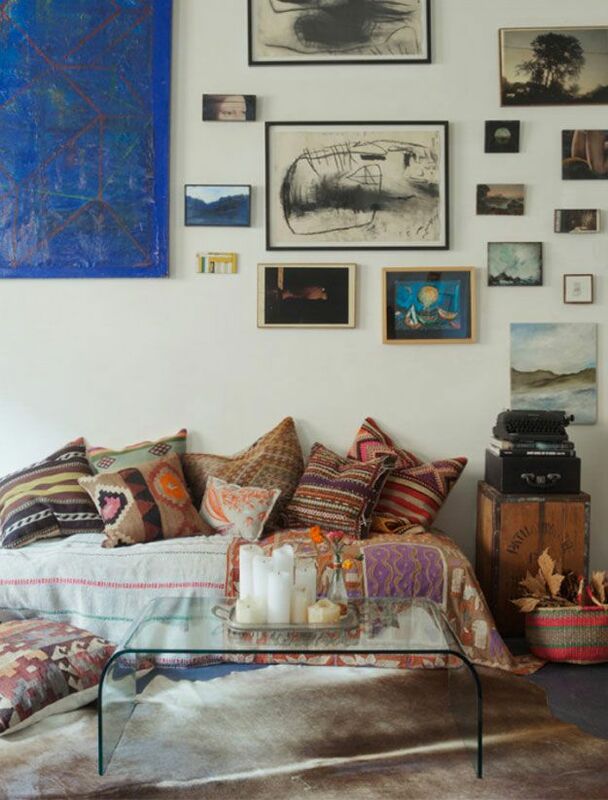 That strategy can work for a small living room like this one. 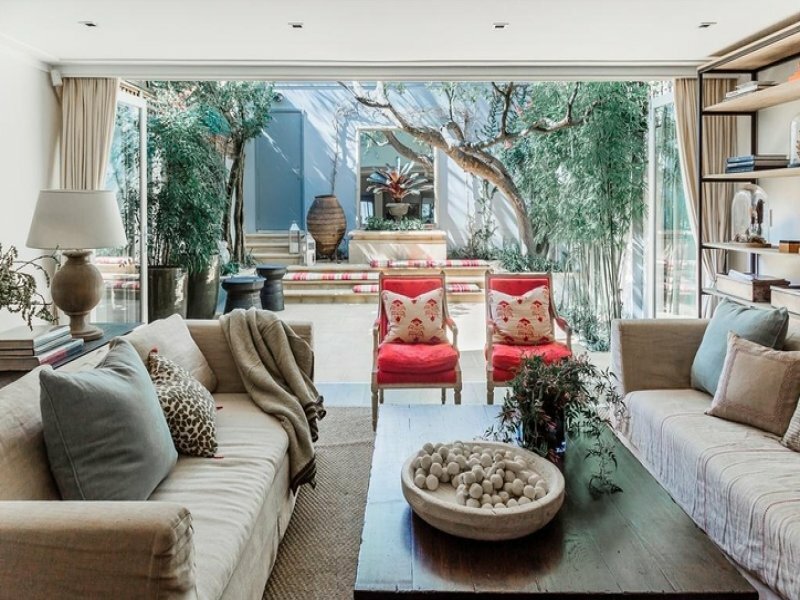 By exposing this living room to the outdoors and minimizing the barriers between the spaces, this area became a lot brighter and feels a lot more spacious, even though the two sofas framing the coffee table take up most of its floor space. 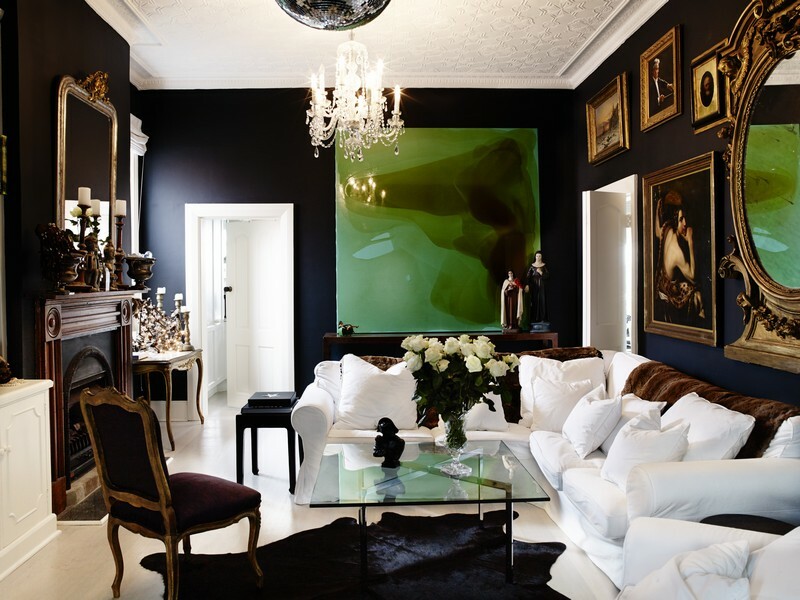 Black and white is a popular and timeless color combination, often used in living rooms. You can’t really go wrong with this combo regardless of the style chosen for the interior design. A similar result can be achieved with combination of light and dark colors. Beige is a beautiful and elegant color which looks particularly chic here when combined with a bunch of wood accents and especially given the green wall visible through the glass doors. 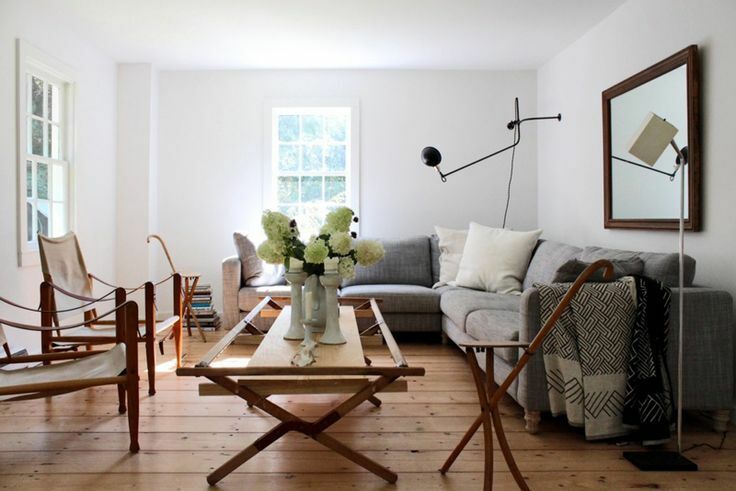 This whole space feels very cozy and comfortable despite its simplicity. 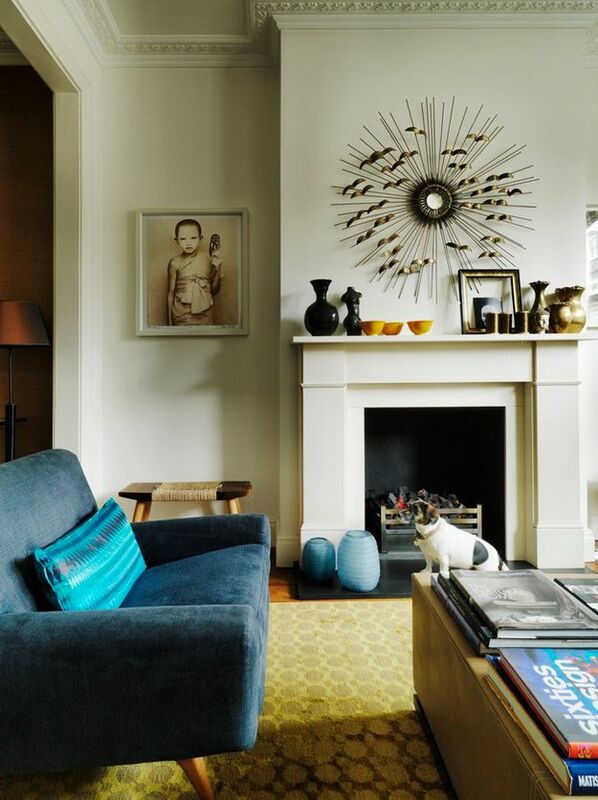 Amber Road also achieved a beautiful balance when designing this eclectic living room. The palette of green and wood mixed with a red-based traditional area rug puts together two contrasting styles. The décor is both modern and traditional, old and new working together to achieve harmony. Variations of the black and white combination can be created using various pastel shades. A beautiful example is the space designed by Shapiro Joyal Studio The faint pink nuances used here contrast with the black elements. Mixed with the natural wood details, they create a feminine and stylish décor. The black and white combo can be used in a variety of ways. Stripes are one option. 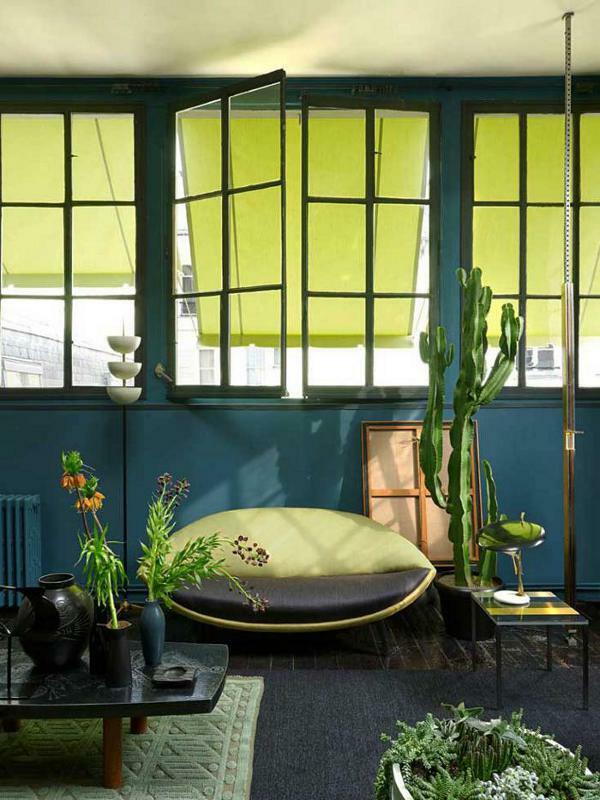 They are used here by Suzy Hoodless in the form of a minimalist area rug which also introduces small colorful accents. The rug complements a décor based on neutrals and pastels. Wood-burning fireplaces and stoves add a unique touch to living rooms. 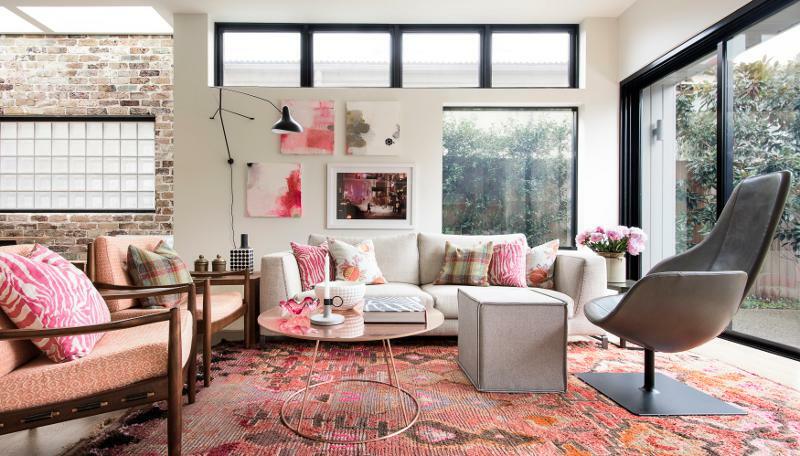 They can be introduced in modern interiors without disrupting the balance, especially if you want to give the room a charming, bohemian feel. By mixing diverse materials, finishes, textures and patterns you can emphasize the desired characteristics and make other seem less striking. 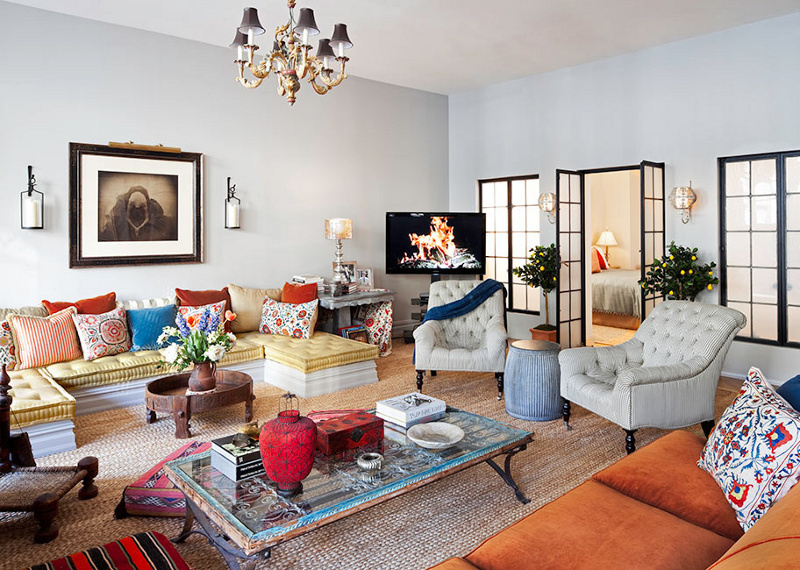 Deborah French Designs introduces here an eclectic living room design which incorporates multiple influences. The windows and doors are reminiscent of Japanese shoji screens while the coffee table adds a rustic touch to a décor focused on mid century and vintage details. Wallpapered walls are a suitable design strategy whenever desiring to add a touch of color or pattern to a room. 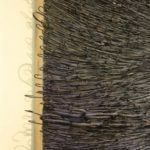 It’s usually used on a single accent wall but there are also cases when it can take over the décor. The pattern featured on the walls can also be integrated in other elements, such as the sofa upholstery. On the other hand, when the goal is a serene and simplistic décor, it’s good to eliminate any unnecessary details and to emphasize the basics. 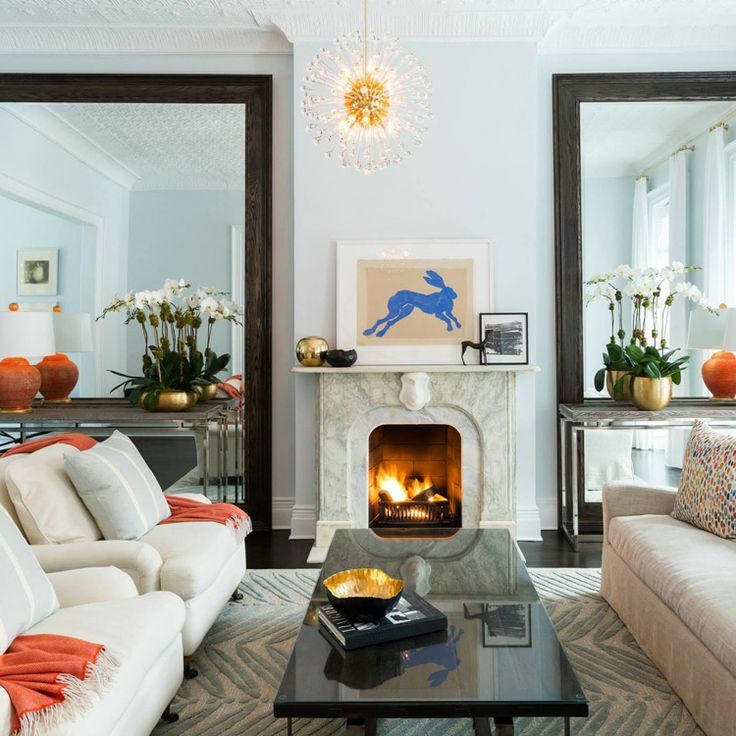 Kathleen Clements managed to do that here by placing a light gray sofa opposite to the fireplace and defining the seating area with a striped area rug. 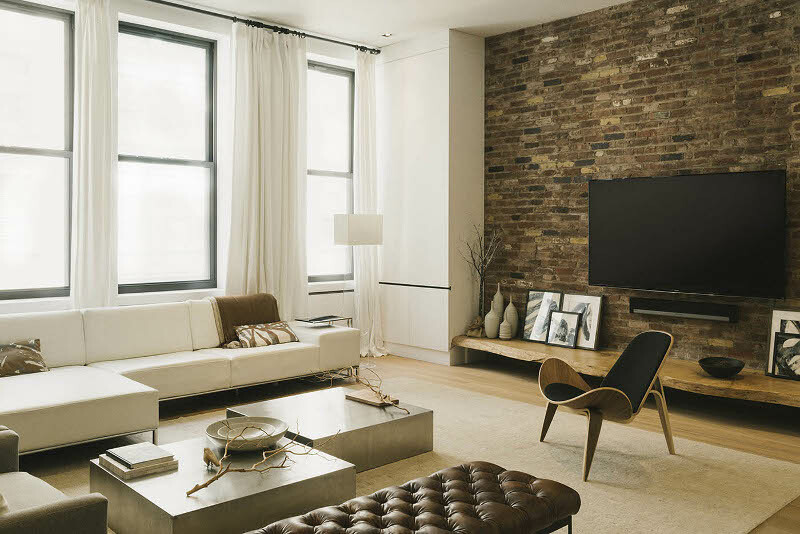 Exposed brick or stone walls are known for their ability to make living room look exquisite. 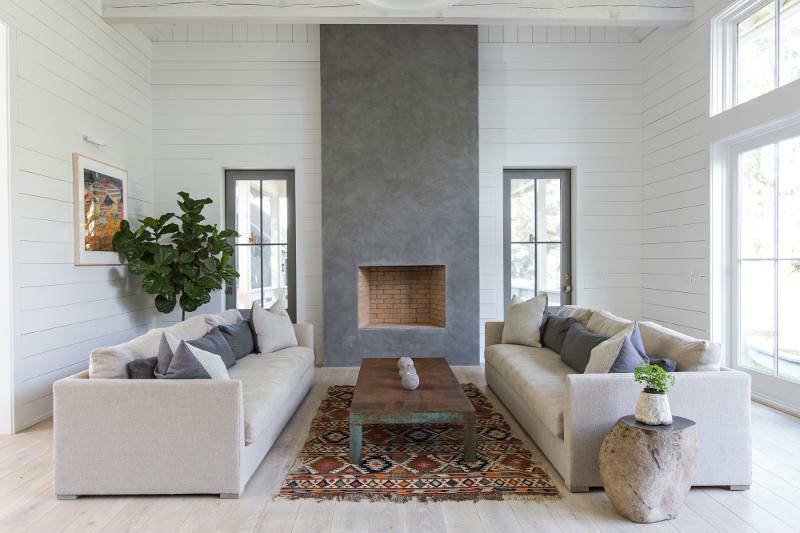 Designer Karen Akers chose to paint the fireplace wall white which concealed its natural color but exposed its textured and imperfect structure. When selecting the accent color for a living room it’s important to think of the impact you want it to have on the ambiance and décor. The red chosen here by double g contrasts with the fade mint green and off-white elements. Red is a powerful color which is best used in moderation. 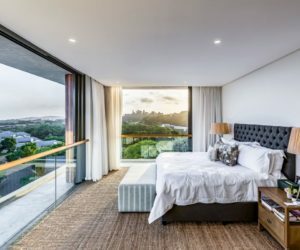 When the goal is to make a room feel warm, cozy and comfortable, too much natural light can have the opposite effect, although we agree this would be a desirable scenario. Limited natural light and strategically directed artificial lighting can have a profound impact on a décor. Studio Ro+CA reveals that in style. Balance is important so overusing a certain color can turn out to be a mistake. 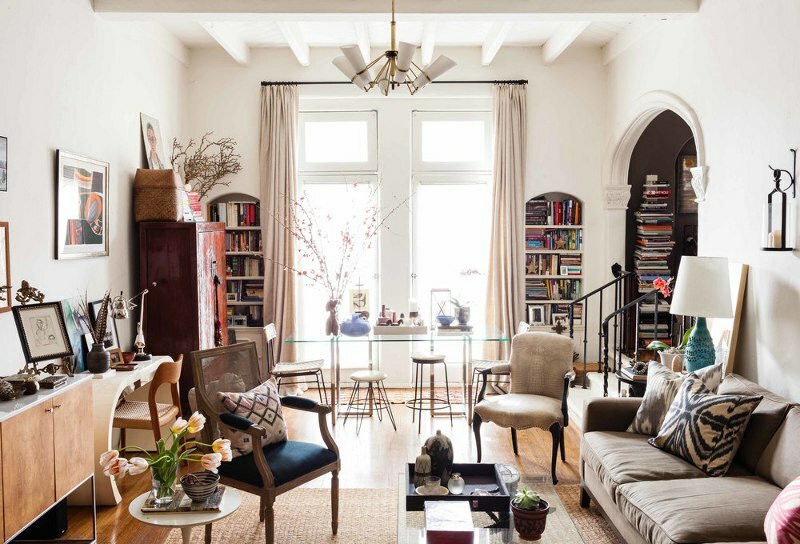 Try to maintain pleasant contrasts throughout the room. 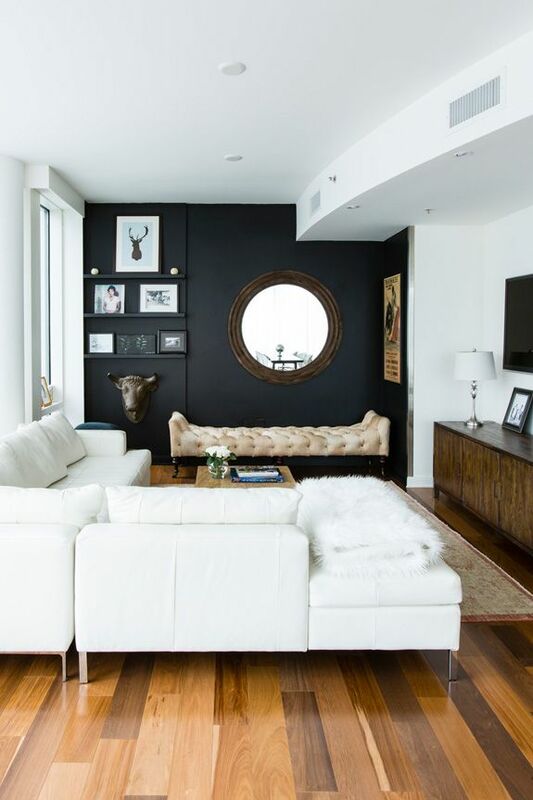 Check out how The New Design Project managed to play with black and white without overpowering the décor in any way. 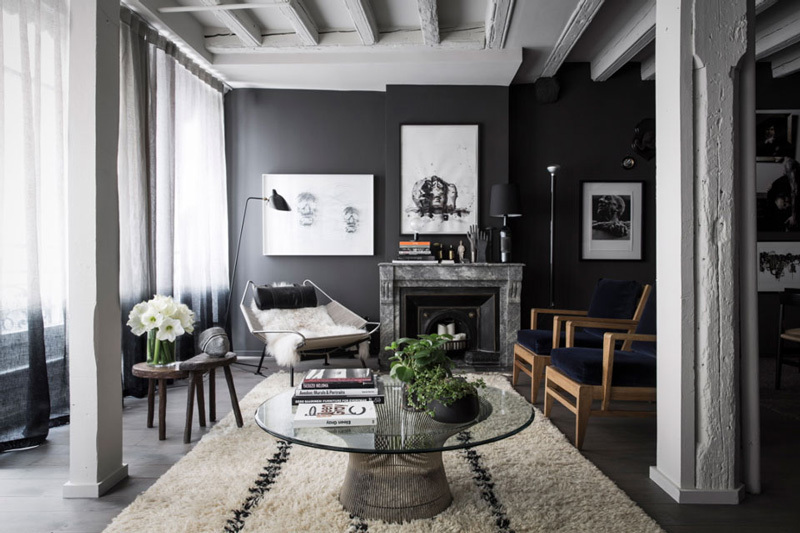 An interesting design strategy for living room is to have one wall painted using a dark color such as blue, brown or even black. Select a wall which can be decorated with contrasting elements such as a white wall clock, a painting or, in this case, a fireplace mantel. 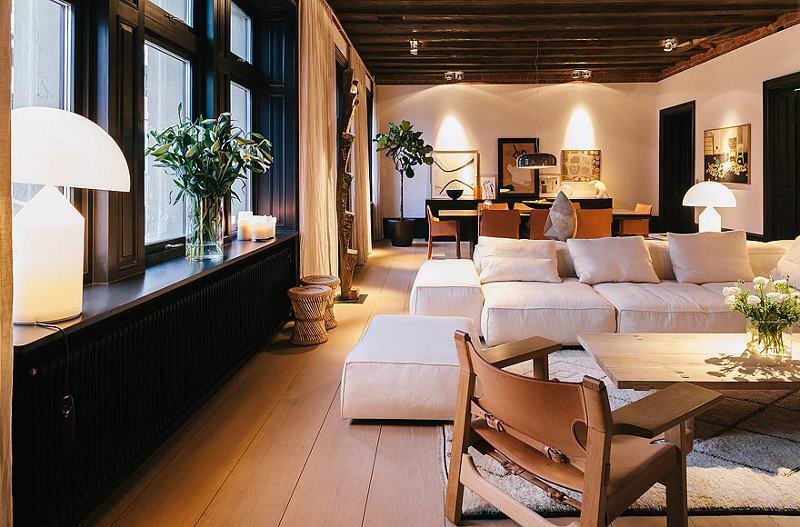 This is a living room designed by Arent & Pyke. Colors such as pink or coral are considered feminine and delicate. 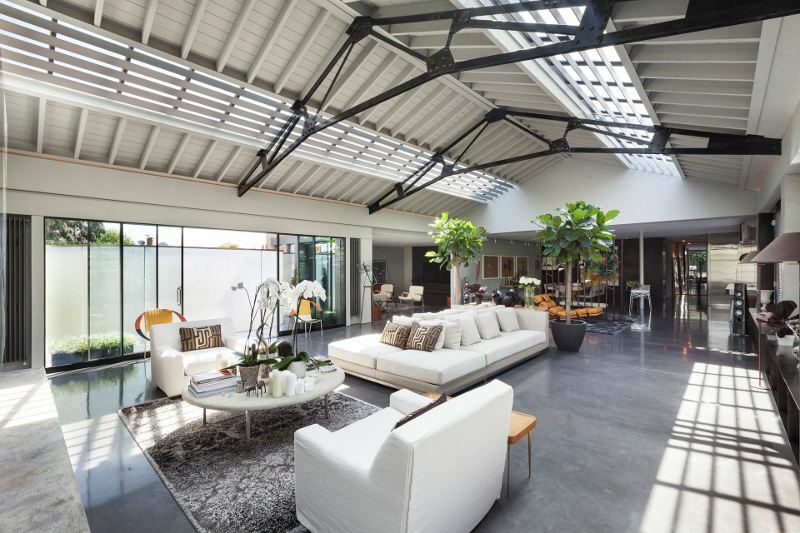 You can use this to your advantage to create a serene oasis inside an industrial-style home. Brett Mickan Interior Design introduced these colors into this living room and the result is a dynamic and unique look. A strategically-positioned armchair can be the accent piece your living room needs to feel complete. 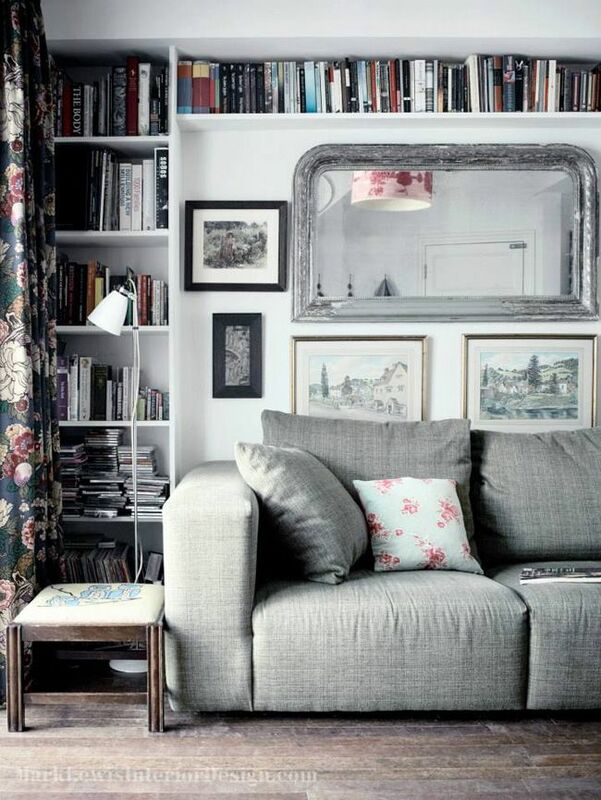 Consider creating a comfortable reading corner or simply using the armchair to fill an empty corner. Complement it with a large potted plant, a floor lamp or a side table. Benjamin Vandiver offers here some inspiration. The living room designed by Tamarkin Co is classically modern and differentiates itself from other similar spaces through a subtle Asian influence which is visible in elements such as the light fixtures, the wood-paneled walls and ceiling, the low and minimalist seating arrangements and the overall austere and yet very pleasant décor. A well-lit living room always stands out. This includes both the natural and artificial light sources and the space designed by THID has them both well in check. The room opens onto a wooden deck while also featuring large windows and glass doors that link it to the outdoors. At the same time, numerous and symmetrically positioned pendant lights offer a pleasant glow at night. 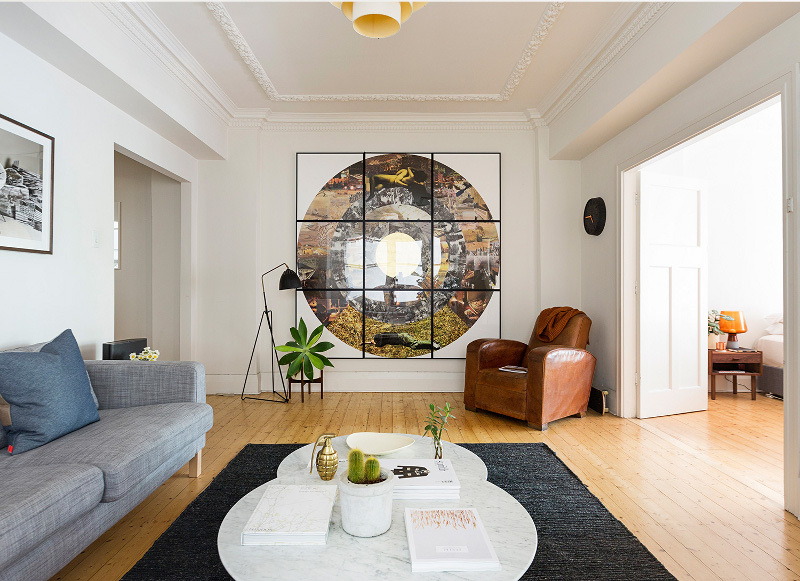 The artwork displayed in a living room can have multiple roles. In the case of the space designed by Bruce Stafford Architects, the wall art captures the diverse accent colors used throughout the room, bringing cohesion to the space and establishing a harmonious ambiance. We’ve mentioned once before that white-painted brick walls can add texture to the space and highlight its uniqueness. 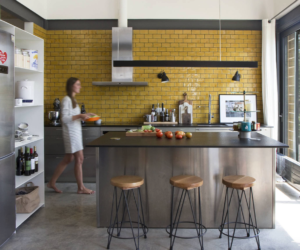 Black-painted brick walls can have a similar effect. They actually look very elegant here, blending modern and rustic beauty. Not all living rooms include a TV. In fact, a lot of them don’t. By eliminating the TV, you open the door to multiple new layouts and design possibilities. 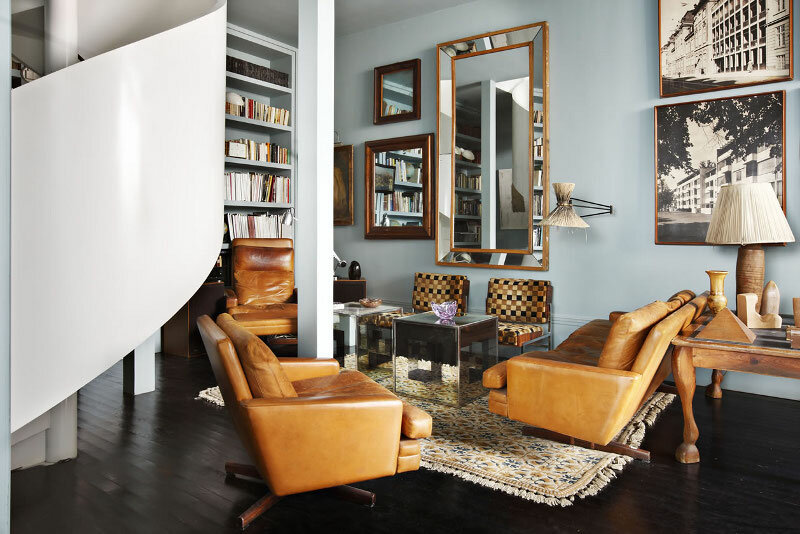 Stephane Chamard proposes an interior design focused on comfort, decorated with a sofa, accent chairs and open bookshelves. A glass coffee table has the potential of making the room look less cluttered. In addition, if the table has a glass top this allows its base to stand out and to feature sculptural and eye-catching designs. As you can see, the coffee table takes center stage in this case, everything else being organized around it. To induce a feeling of comfort and coziness, Pearson Design Group used here a thick faux fur rug complemented by matching chair covers. To avoid making the décor feel heavy and overwhelming, a set of lightweight pendant lamps were added. 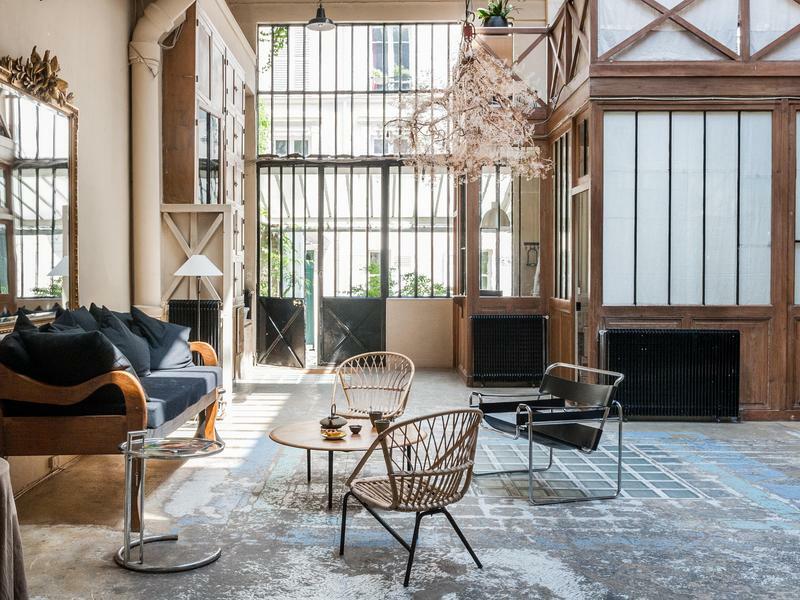 Striking contrasts and visually powerful design elements are sometimes put together and the result is a space which could look similar to the living room designed by Jean-Francois Jaussaud. As you can see, the walls are deliberately left unfinished, with portions of exposed stone becoming visible. These elements contrasts with the modern furniture and accessories. 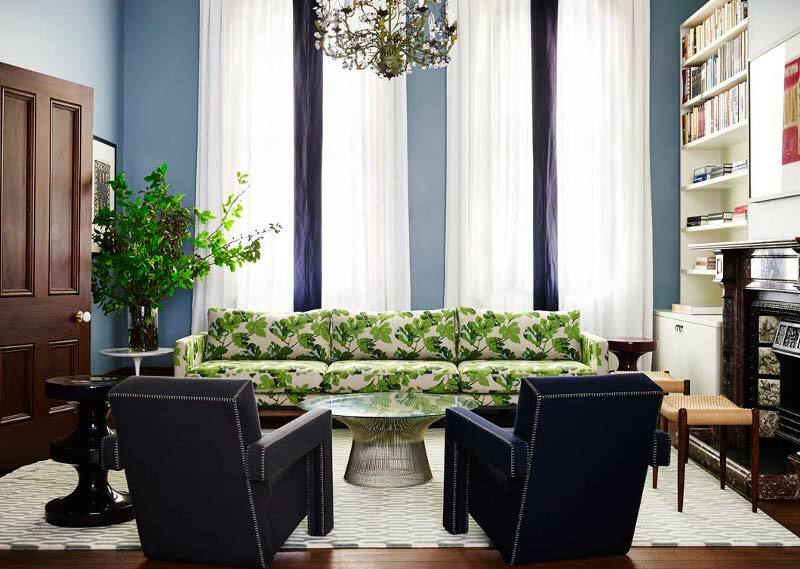 A very different approach was used by Hillary Robertson when designing this small but very chic and pleasant-looking living room. The use of soft color tones, detailed and sculptural lines and simple, natural materials offer the room a feminine touch. 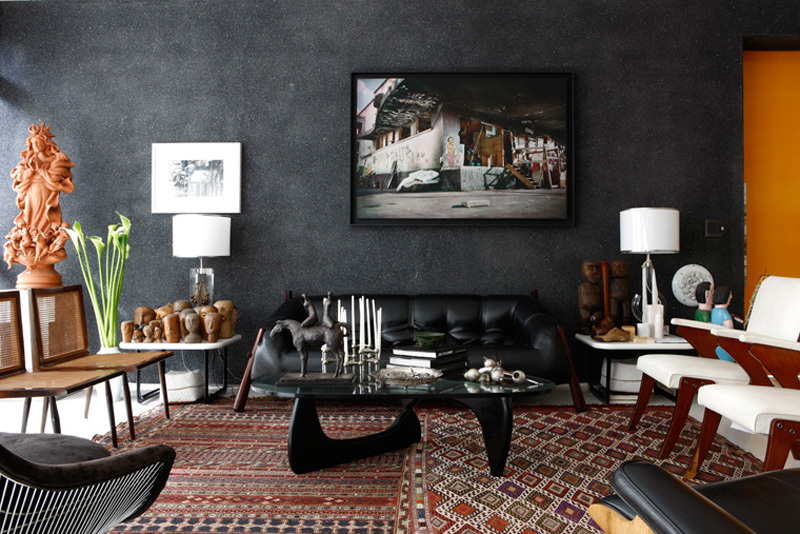 The gallery wall put together by Bricks Studio is eye-catching but not in a very striking or opulent way. 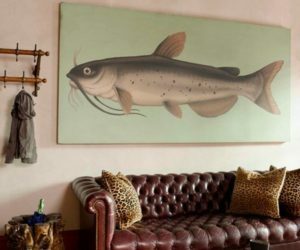 The framed artwork displayed here doesn’t introduce strong and new colors but rather has the role of establishing a homey ambiance, considering the glass wall which exposes the room to the adjacent space. 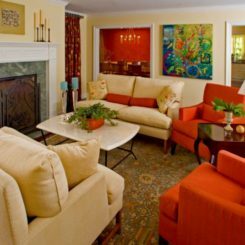 You can use multiple strategies to make a living room feel welcoming and comfortable. For example, combine a textured rug with a wood coffee table, a fabric sofa or sectional with lots of cozy pillows and a few personal decorations framed on the wall behind it. There are two types of people: those that prefer a fabric sofa in their living room and those that enjoy more a leather sofa or couch. Each material has its own advantages and disadvantages. Leather furniture tends to look more elegant, sober and imposing whereas fabric upholstery makes it look more casual. Instead of a sofa, Felix Forest shows us here a casual and minimalist daybed, ideal for relaxing while reading a book under the warm light of the corner floor lamp and while enjoying the warmth of the fireplace. 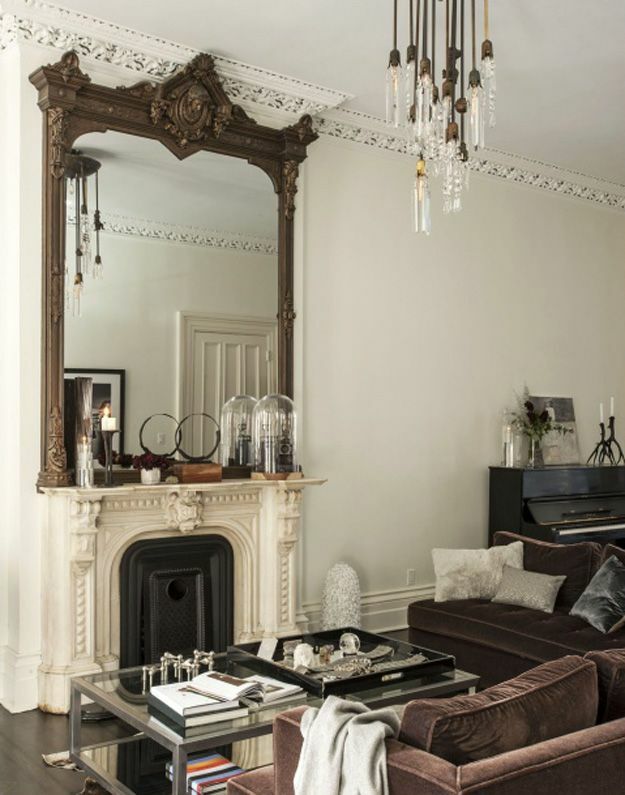 The framed mirror placed on the mantel is a chic touch. Traditional living rooms welcome architecture into their interior designs, featuring wall and ceiling molding and intricately carved details throughout. All these elements put together can make a room look very busy so balance has to be established. The team at Roman and Williams offers an inspiring example right here. Each one of us has their own style and their own idea of how a living room should look like to be comfortable. 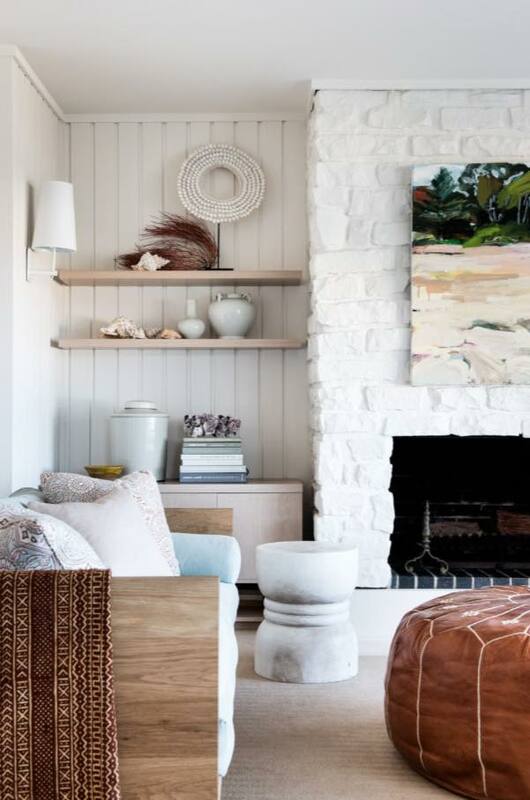 For some, a perfectly aligned décor can be satisfying while others find more pleasure in an imperfect design with a bunch of pillows scattered across the room and a fusion of cozy fabrics. 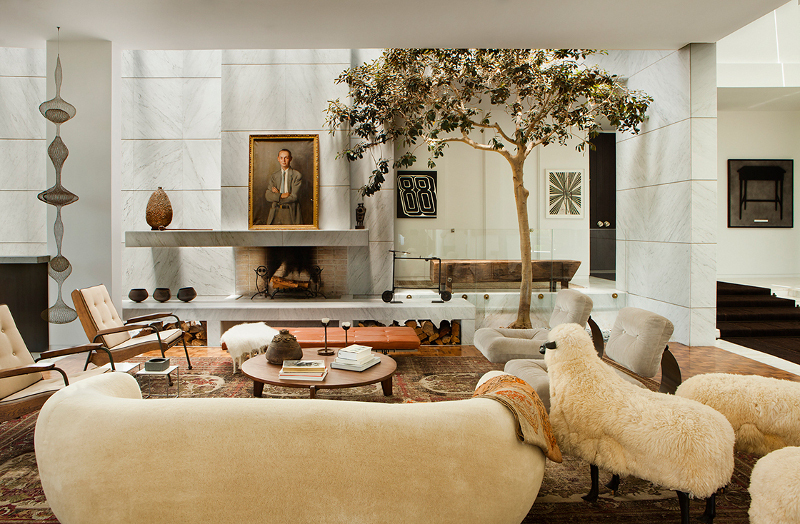 The living room designed by Blair Harris is interesting for several reasons. It has a large bookcase which covers an entire wall, a sculptural ceiling design mixing white and brown patches and a pendant lamp resembling a sea urchin. An interesting detail we found in the design created by Filippo Bamberghi is the fact that the area rug actually appears to be made of two different sections with different patterns and matching colors. 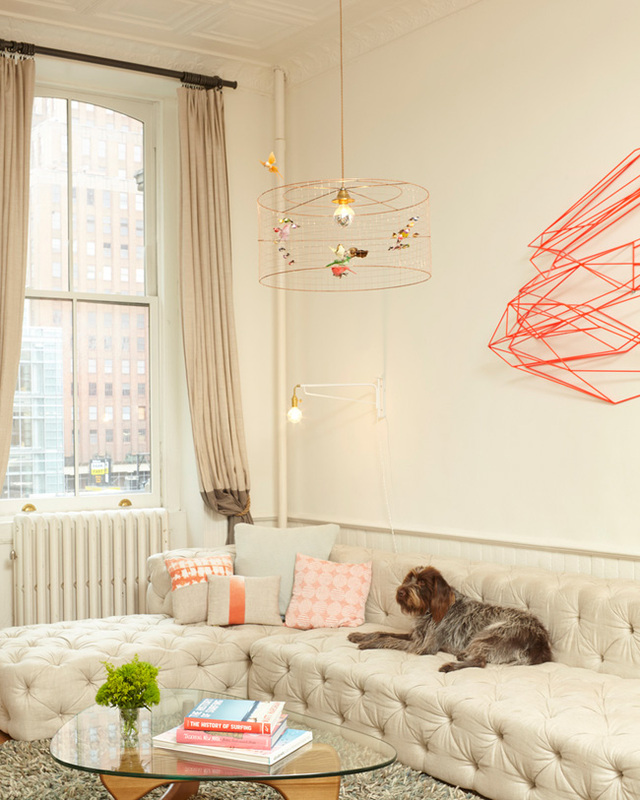 It’s a quirky way of adding some interesting to an otherwise conventional living room. 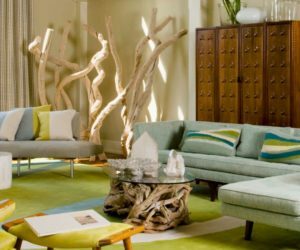 If you want to feel closer to nature without having to leave the comfort of your living room, then you can decorate this space with natural, organic materials. A live edge coffee table can be an interesting element which you can use in combination with wood and rattan seating, driftwood artwork frames and an animal skin rug. Animal skin rugs are more versatile than you might think. 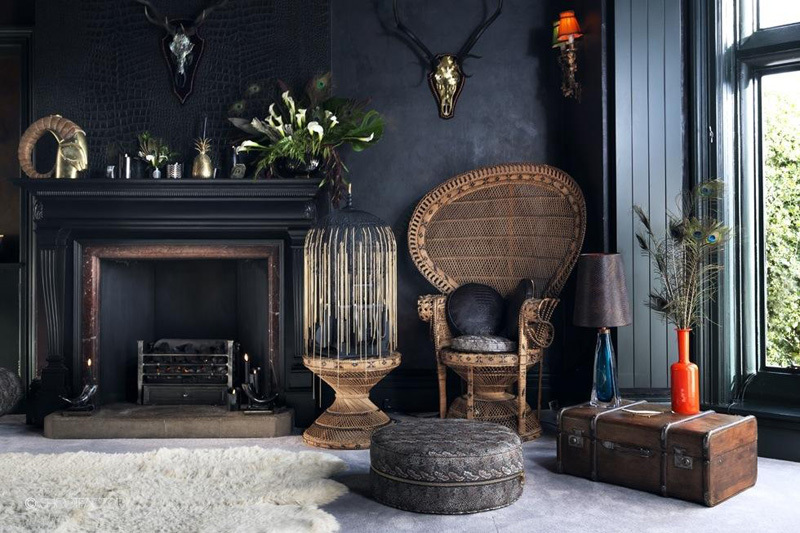 They can look very chic in rustic, traditional, modern or eclectic spaces. 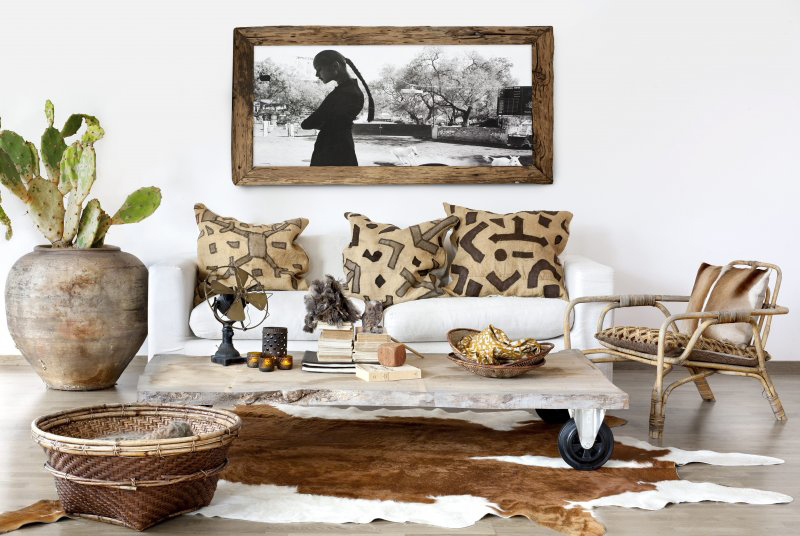 One with a zebra print such as the one used here by Virginia MacDonald can be the missing accessory in your living room. Other interesting living room ideas which you can apply to your own home are offered by Pearson Design Group. In this particular setting they turned they designed what appears to be a bar with firewood storage inside its frame. The play of linear and curved forms in the case of the living room designed by Stephane Chamard is creating a nicely-balanced and enjoyable ambiance in a subtle way. The room also has some refreshing vintage charm which goes well with its modern simplicity. The little details impact a room in a great way. Simply choosing the right main colors, materials and finishes for a living room is not enough to actually make it feel right. 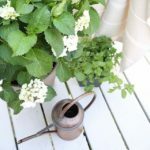 It’s important to pay attention to the little things like the small table you keep in the corner by the sofa, the small pillows you sometimes throw on the sofa or the artwork you display on the wall. If there’s a large and bulky sofa or a big sectional in the living room, covering a considerable amount of floor space, it would be advisable to keep the rest of the furniture as simple as possible. Workstead used here casual armchairs with sleek wood frames and fabric seats and a matching coffee table which a slender top. 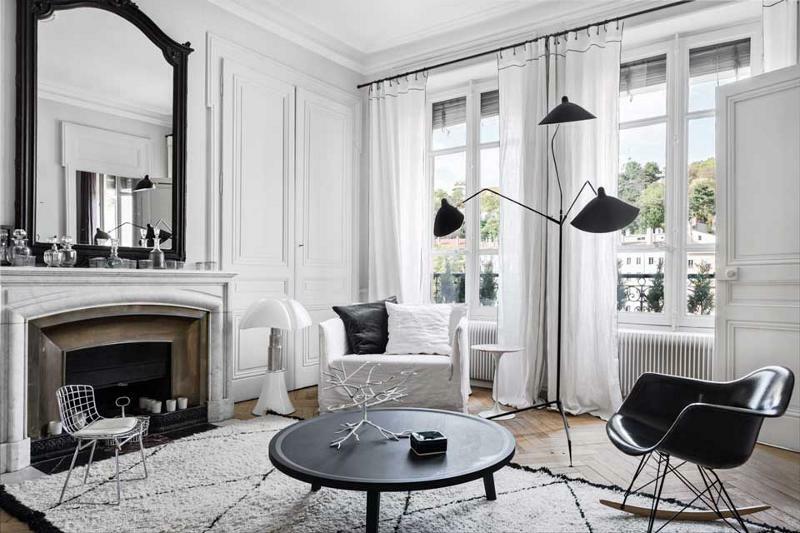 Elements such as the matching coffee and side tables, the oversized floor lamp with an adjustable arm and the frames displayed casually on the wall offer the living room designed by Jonas Jingerstedt a graphical look emphasized toned down with the gray color palette. A living room can have one or more focal points, depending on its interior design. This one is quite intriguing from this point of view. The oversized light fixtures is definitely eye-catching and imposing but so is everything else. The combination of colors, textures and forms is pretty perfect. 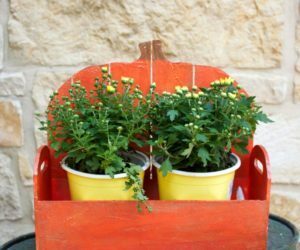 There are numerous simple and practical DIY projects you can try for your home. For example, check out these unique shelves made of re-purposed wooden crates. You can replicate the design without actually having to change anything about the crates. 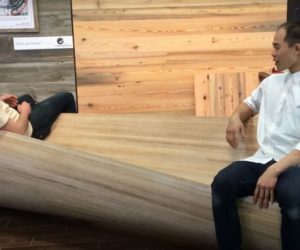 The couch also seems to be standing on a platform made of wooden pallets. Mixing multiple colors and finding the right balance is challenging, especially when you’re working with several different materials and finishes. This living room has things well under control. 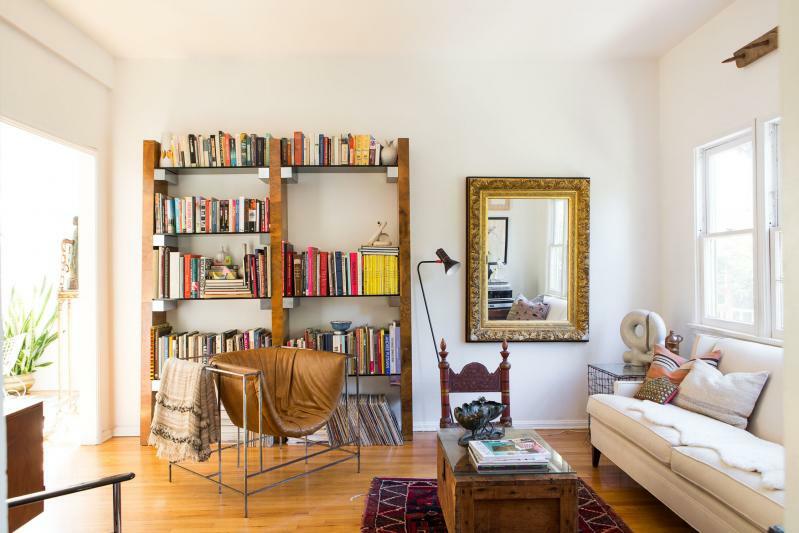 The sofa cushions, the wooden frames, the curtains, floor, area rug and the books and ornaments all contribute to a harmonious image. A nice way or organizing a long and narrow living room is suggested by Brittany Ambridge. This space is divided into two distinct lounge areas, both incorporating comfortable seating and accent tables and lighting. In between then is a divider with a built-in fireplace which can be enjoyed from both sides. 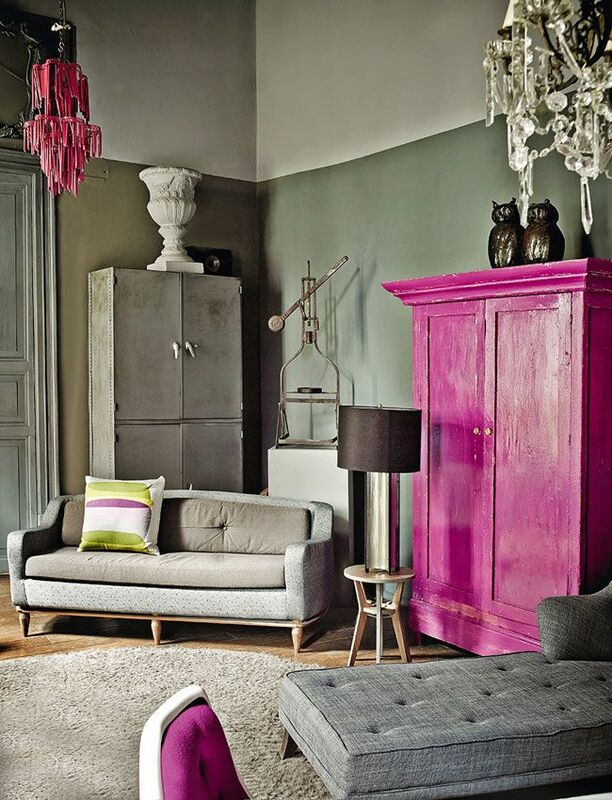 The pink cabinet is definitely an unexpected element in this gray living room designed by Dirk Jan Kinet Interiors. 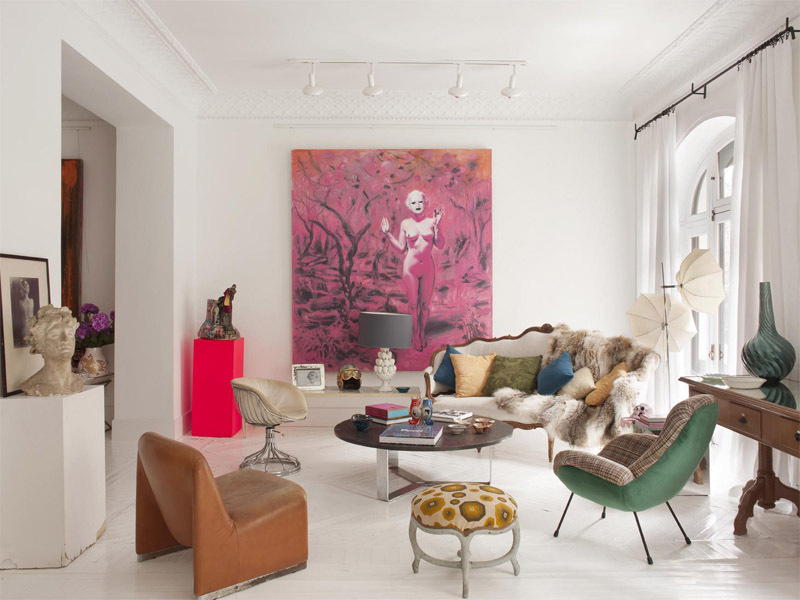 There are also several other pink accents in the form of an accent chair, a chandelier and a striped throw pillow. They cheer up the room and make it memorable. 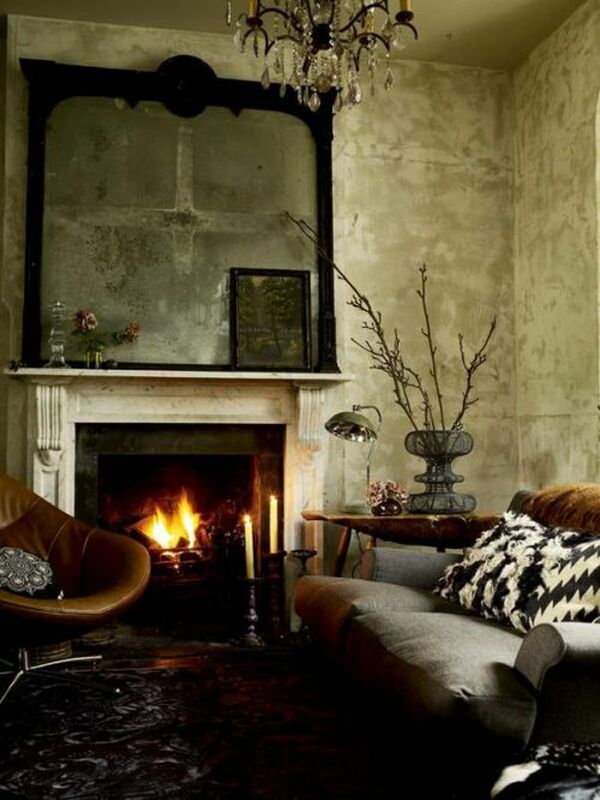 The way the framed mirror appears to become a part of the fireplace mantel is really beautiful. 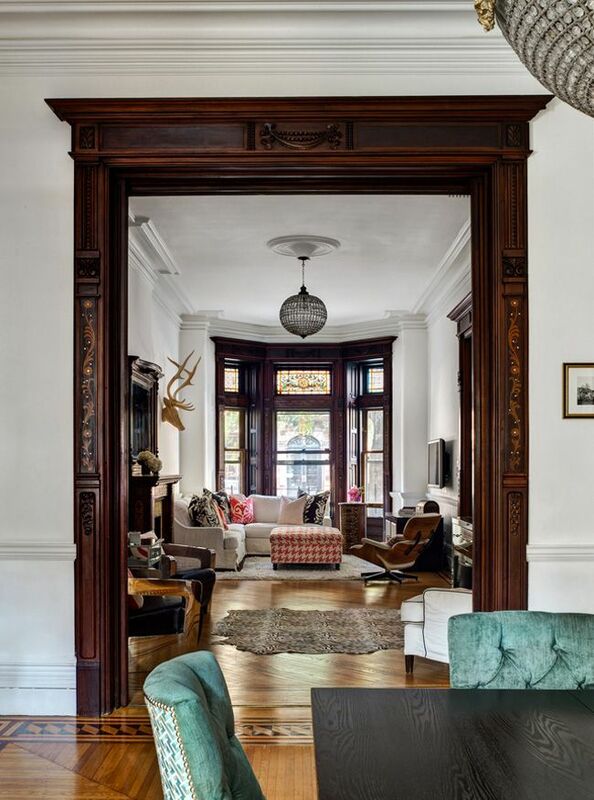 This is a living room photographed by Matthew Williams and its décor is accentuated by intricate carvings, antique pieces and molding. As you can see, gray is a popular main color for a lot of living rooms. 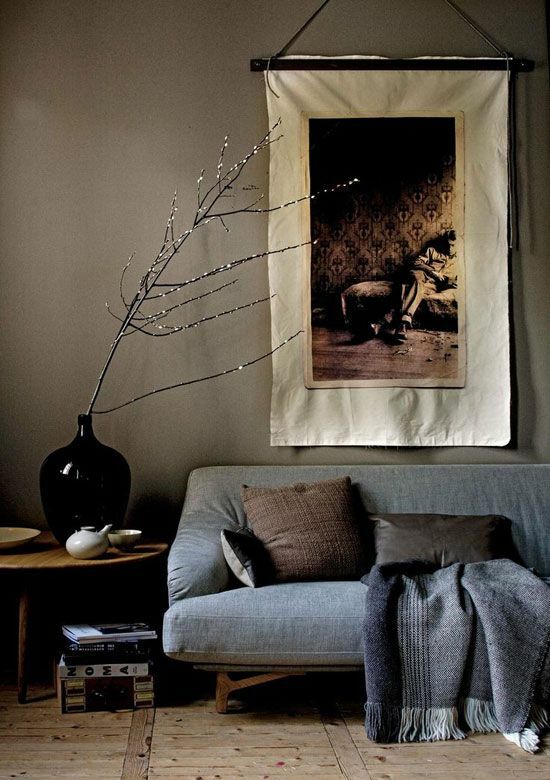 This is a versatile and neutral color which can look boring and unappealing if not used right. 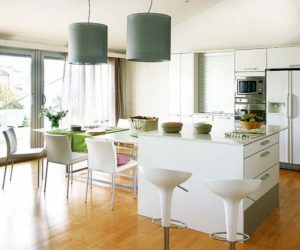 However, it also has a lot of potential, being a prime choice for a lot of modern interiors. When working with black and white, a third color is often needed. It can be a bold and striking shade such as red, orange or green but it can also be the natural and diverse multitude of natural wood tones. This is a flexible and very inspiring combination which can be adapted to suit a variety of styles. A layered design can be achieved by mixing and matching a diversity of colors and patterns. 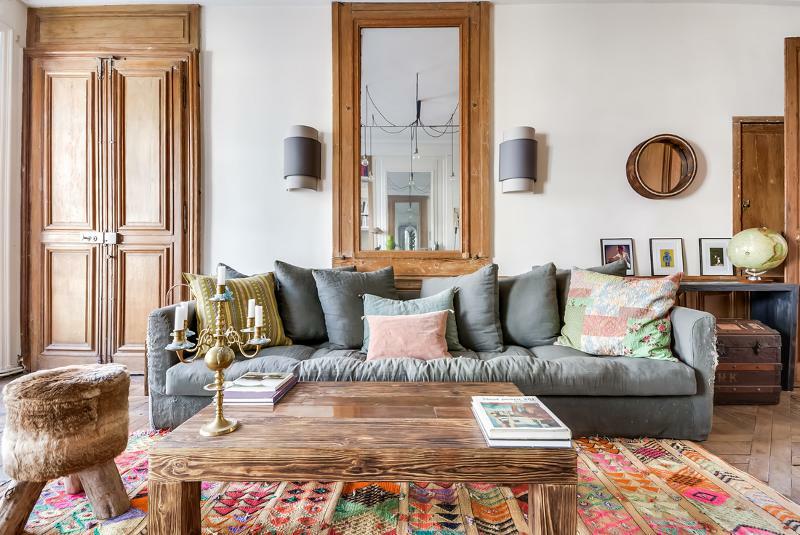 In the case of a living room, this look can materialize into a space with parquet flooring, a lightweight area rug on top, a sofa with an ornate wooden frame, fabric upholstery and a multitude of accent pillows on top of all. 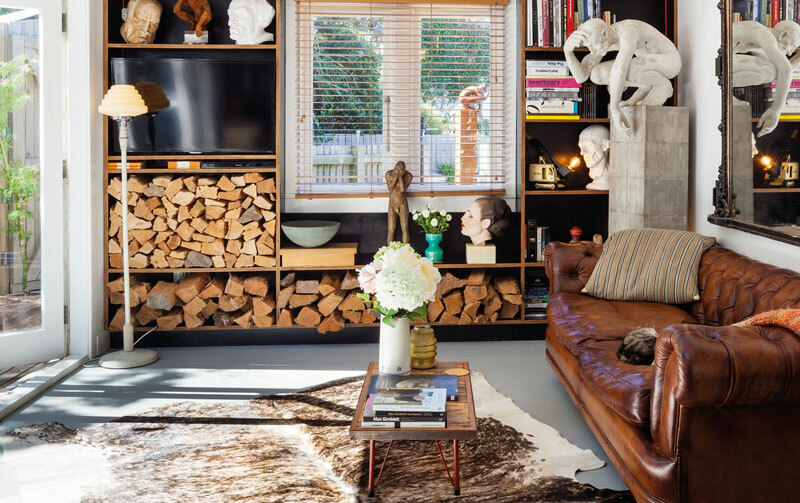 In case you’re having trouble finding the right way to integrate firewood storage into your living room’s interior design, check out this innovative and pretty simple idea. A custom-designed wall unit can frame the window, featuring firewood compartments which double as décor for the space. The sunburst decoration displayed above the fireplace is based on a simple design pretty easy to reproduce with skewers and a small mirror. However, the particular design chosen here by Juliette Byrne has its own distinct particularities which allow it to stand out. Obtaining the type of textured featured here is a bit more challenging than some might think. The design is intentional and never the same. 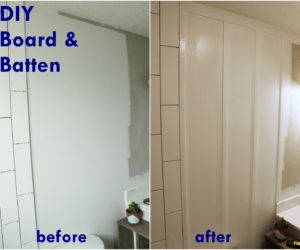 It takes patience and skill to get it right when you’re starting with a plan white wall. The design blends well with the warmth of a traditional décor. 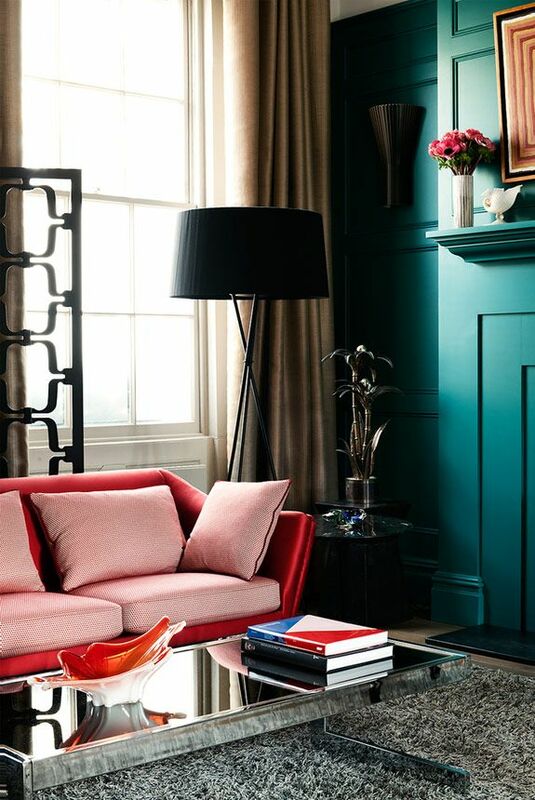 Both the turquoise wall and the red sofa are very eye-catching on their own. These two elements put together can clash if not balanced out by other details. In this case, those details are the light brown curtains, the textured gray rug and the matte black lampshade. Brown is a color that mixes well with other shades such as green, turquoise or orange. 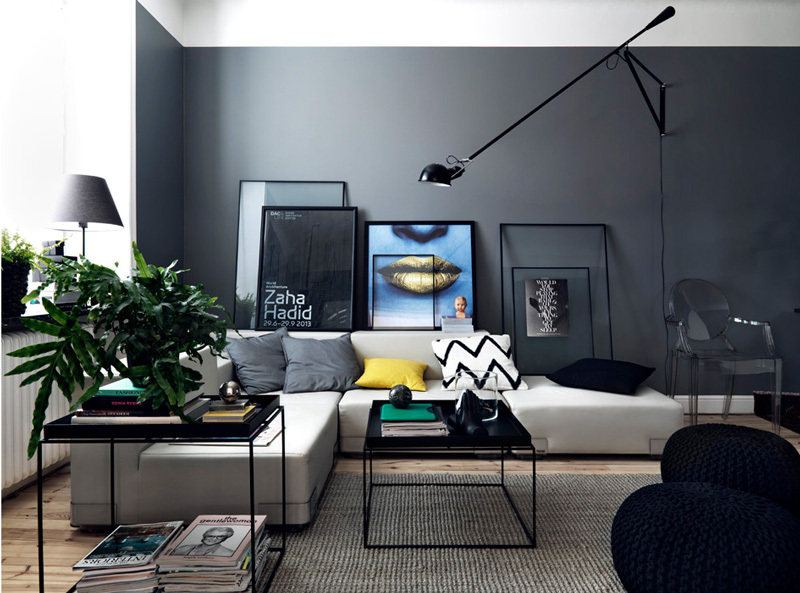 However, when combining it with neutral tones such as gray or black, it can become monotonous. 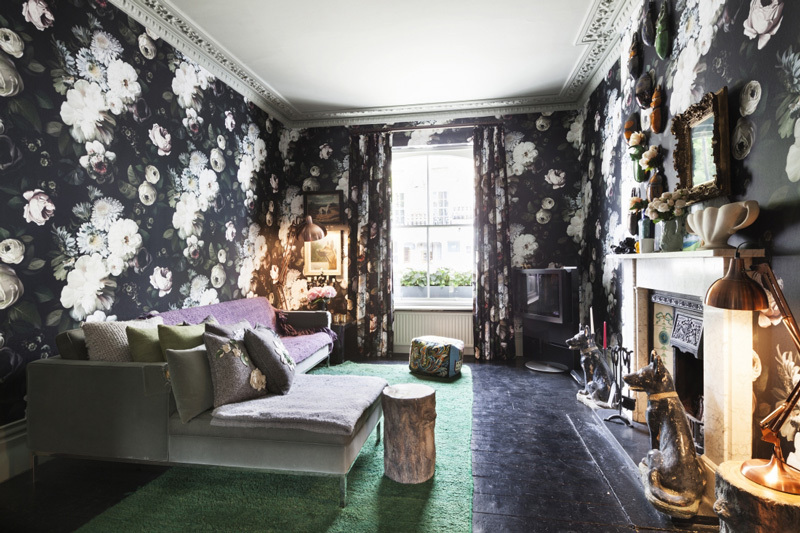 Interior designer Andrew Howard avoided that by blending several different textures and materials. The same thing can be said about gray which is not a particularly interesting or eye-catching color. 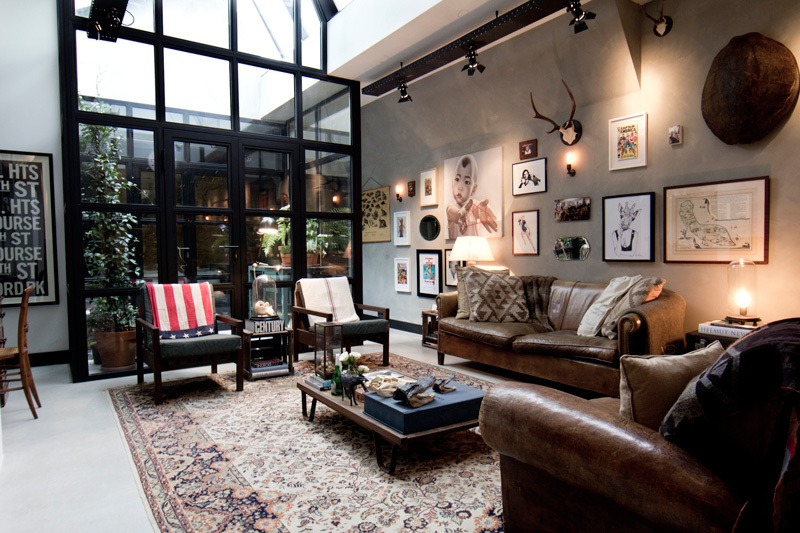 However, it can be the perfect choice for a living room infused with vintage, rustic and industrial elements. Designer Mark Lewis offers us a glimpse at the design possibilities in such a case. The accent color you choose for a living room can be highlighted in more than one way. 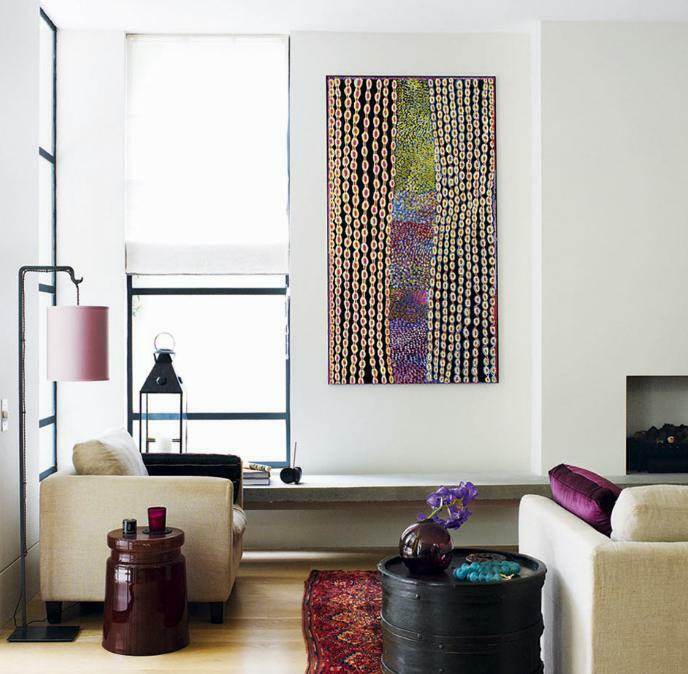 Displaying big blocks of colors in the form of abstract artwork or furniture is one option. A different strategy is to use that color is small amount and to evenly distribute it throughout the space. Check out how Turned Pocock acted in this case. A living room with bay windows is a treasure from the start. Tamara Eaton had to design such a space and the strategy chosen was to have the sofa placed in front of the windows for a nice view rather than positioning it in front of the fireplace. 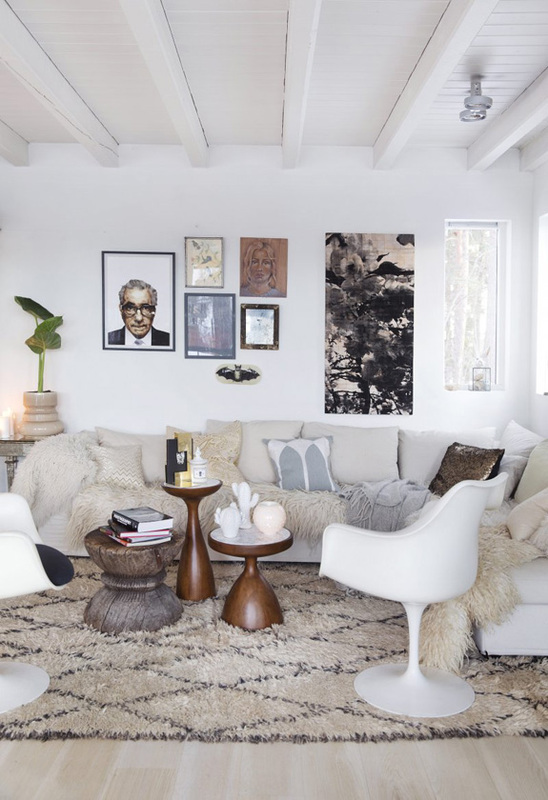 When the walls of a living room are as striking and busy as in this case, everything else seems pale by comparison. As a result, a lilac-colored sofa or a green area rug don’t seem as eye-catching as they would in a different environment dominated by neutral tones and simplicity. On the other hand, anything can stand out when you’re working with a white room. 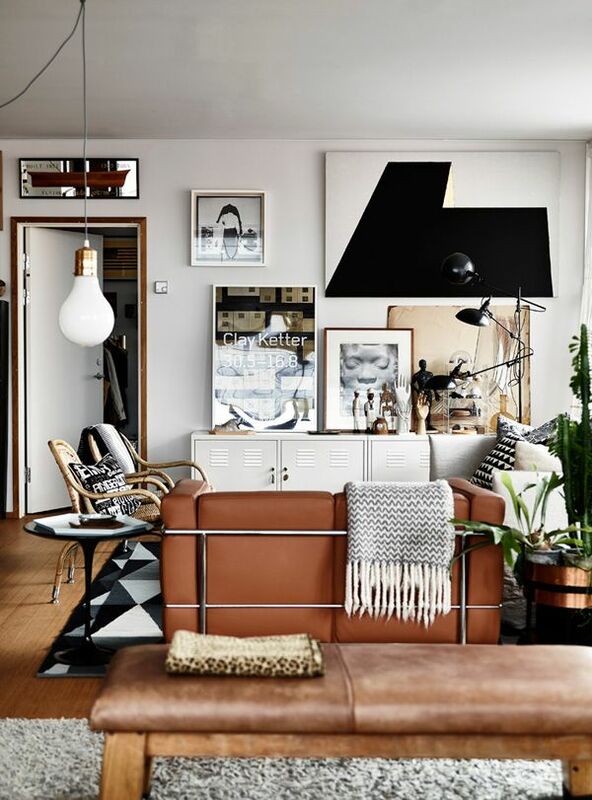 A brown leather sofa is not exactly what you’d call eye-catching and yet it stands out here by contrast. Similarly, the accent armchair is a welcomed element in the décor. When there are several different focal points in a room, it each has to bring new to the décor in order to stand out. 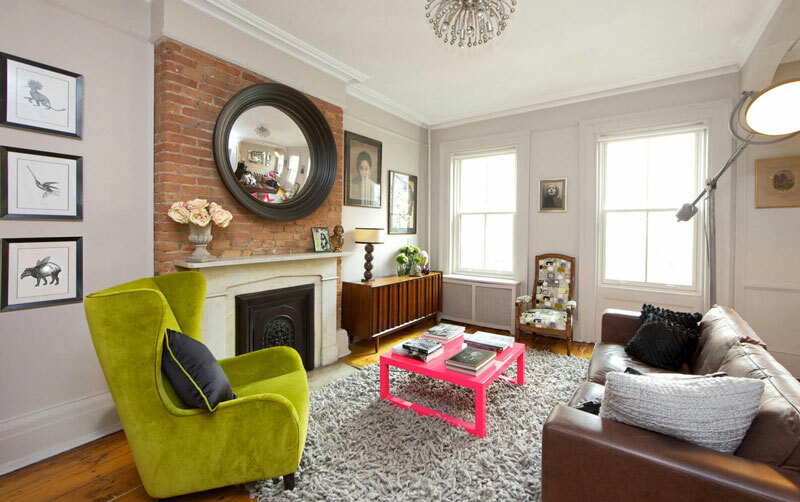 The New Design Group highlighted here the exposed brick fireplace wall, the ochre-colored armchair and the neon pink coffee table giving each the opportunity to stand out. In a lot of cases, however, a single accent color is enough. 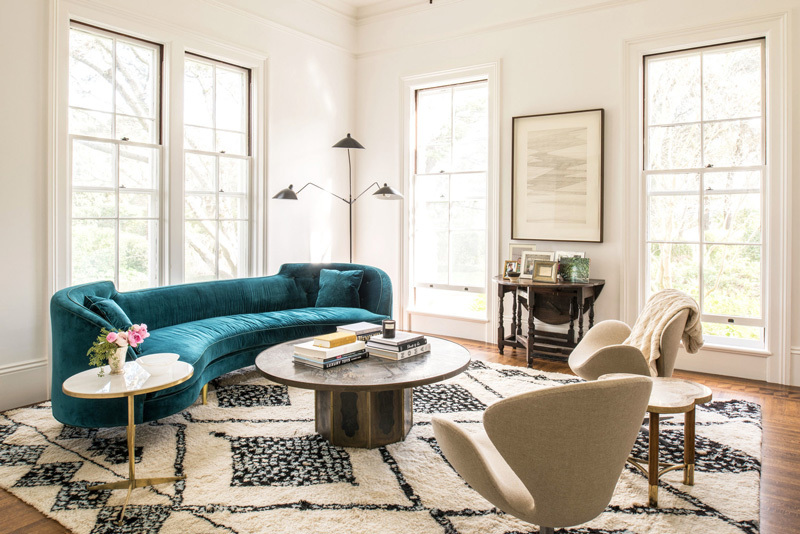 Katie Martinez chose for this modern living room a sinuous sofa featuring a beautiful shade of turquoise. This is only colorful element in the room, everything else being beige and neutral. A living room can also look beautiful without needing any brightly-colored elements. 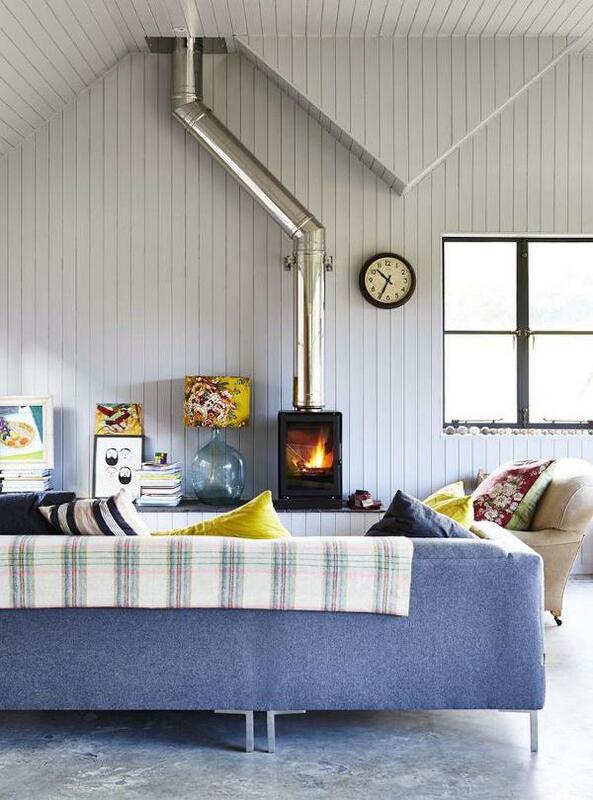 Carla Lane shows that with a design that looks very inviting, comfortable and user-friendly, where a sofa and a daybed frame a rectangular area rug and a centered coffee table, with a fireplace as a backdrop. Geometry adds interesting to a lot of things, including interior design. It’s enough to play with a few simple shapes to reveal the concept’s beauty. Geremia Design chose two square coffee tables for this living room which complement a large and rectangular piece of wall art as well as a checkerboard-themed accent decoration. The molding framing this wall mirror is one of the main elements which make this living room stand out. 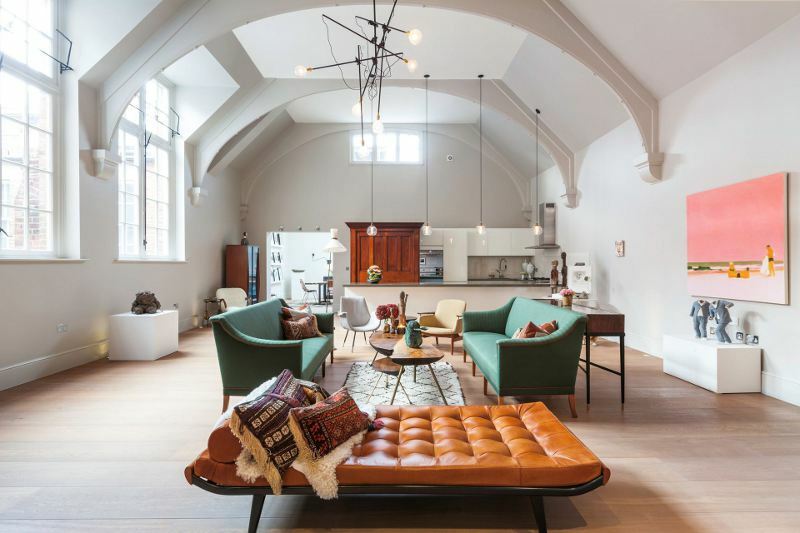 This is a space where old meets new, where traditional and modernity work together to give charm to a space where everyone has to feel welcomed and comfortable. Large bay windows make this living room appear rounded in shape. This impression is emphasized by an oval sofa and a pair of elegant armchairs. The round top coffee table and the floor pouf further highlight the same concept together with the traditional layered chandelier. Aaro Architects gave this open plan living space its own distinctive character by having the sofa placed with its back facing the portion of the volume containing the dining area. In addition to that, the window unit creates a prominent barrier between the space and the outdoor surroundings. 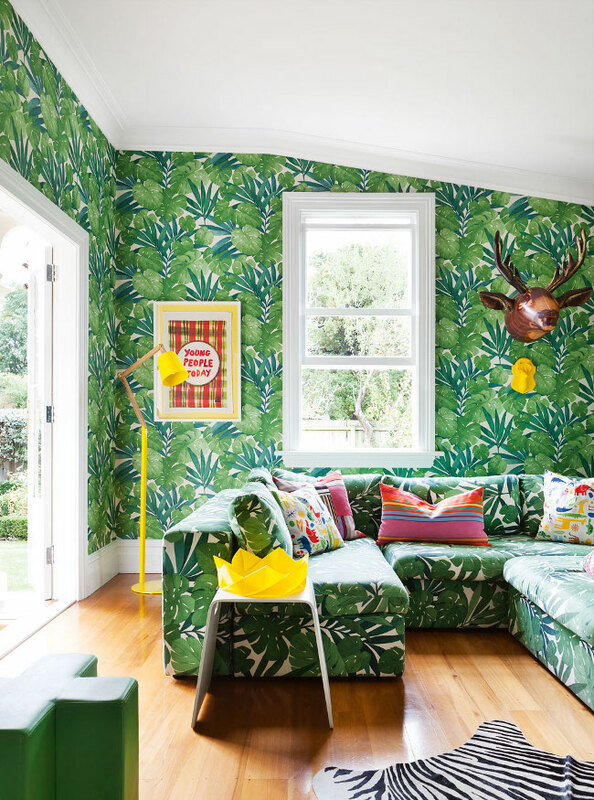 Jessica Hedgerson shows us here how to make the most of a small living room. The corner sectional sofa is framed by a large open bookcase that goes all the way up to the ceiling. 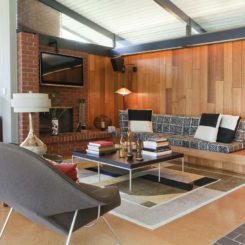 Although limited, the space in front of the sectional is very cozy thanks to the natural wood coffee table/ bench and the area rug. A framed portrait displayed above a fireplace is not exactly an eye-stopper. However, it is in this case. That’s because the store fireplace wall is very beautiful and interesting on its own. 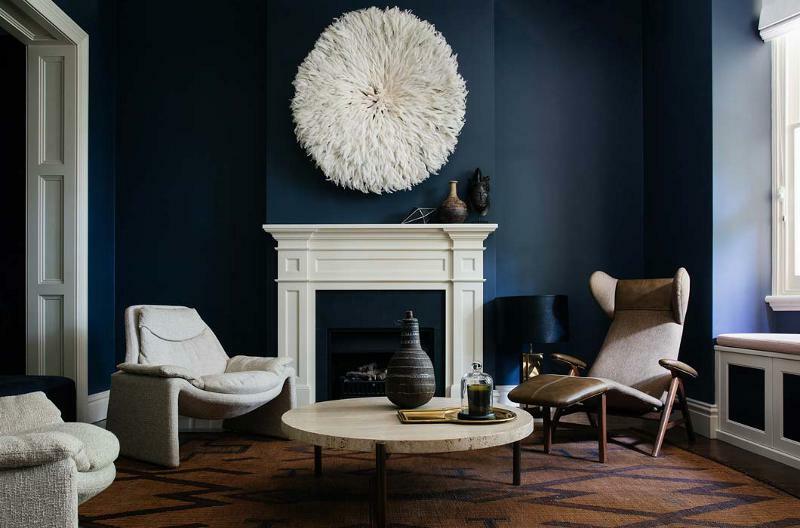 The rest of the décor is chic and combines blue accents with natural wood and a furry area rug. 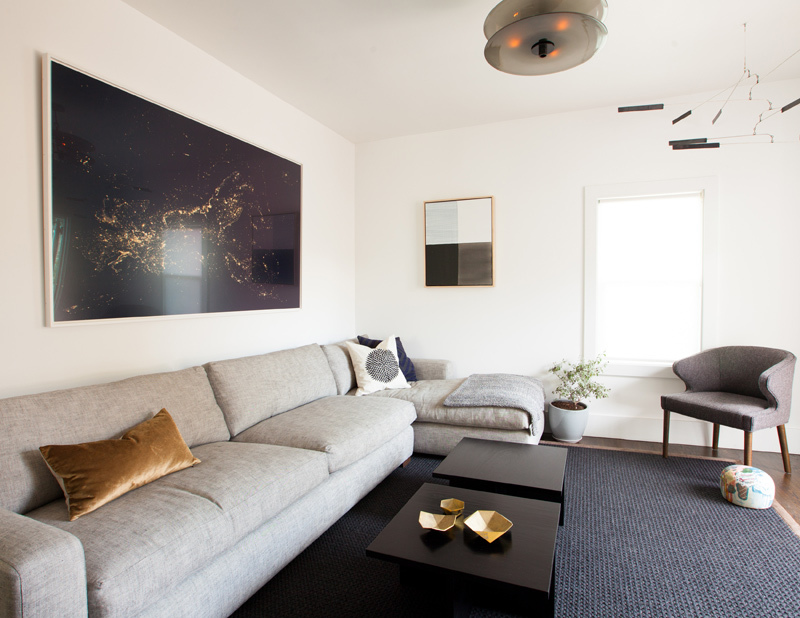 Although the small living room designed by Chelsea Hing has black walls, this doesn’t make it feel dark and gloomy. It fact, it allows it to look crisp, chic and modern. The white open shelves and the matching window shutters create an interesting contrast while the blue sofa brings everything together. We find this living room intriguing and artistic. All the elements integrated here are interlinked in one way or another. Both the rug and the green accent chair have something nature-inspired and the floor lamp’s colorful shades add interest to that portion of the room, complementing the simple coffee table and cabinet. When the living area is directly connected to the entryway, there has to be a smooth transition between these spaces. In addition, you have to put in a bit more effort when making the room feel warm and inviting and not exposed and lacking privacy. That can be done with the help of certain materials and colors such as wood and warm, earthy tones. 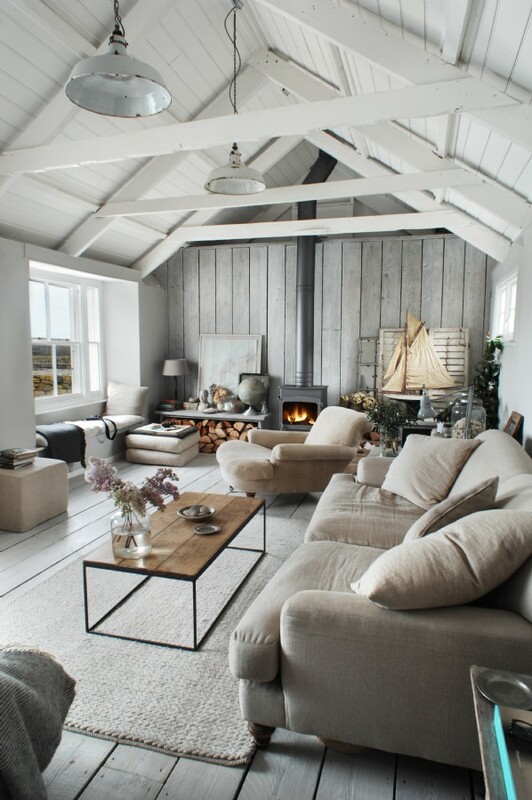 The living room of a beach house or holiday home should be bright, airy and relaxed. 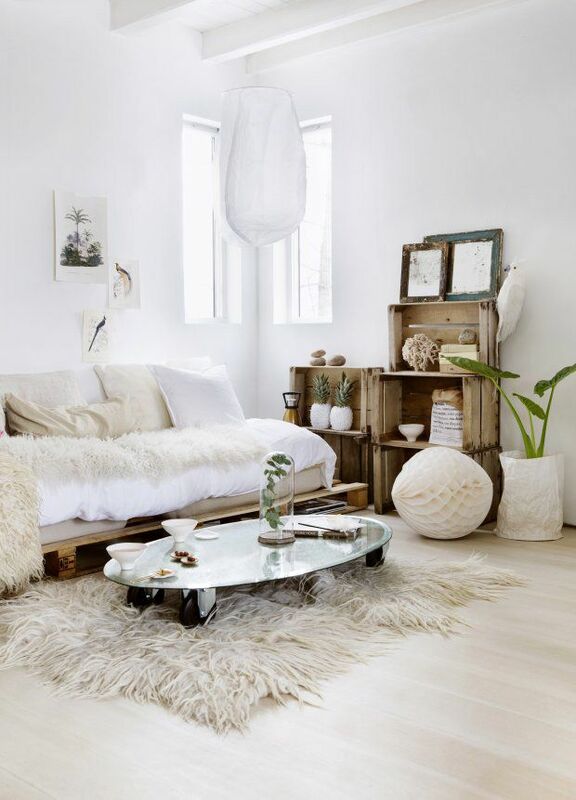 Light colors, simple and chic accessories and quirky patterns are often a part of such a décor. 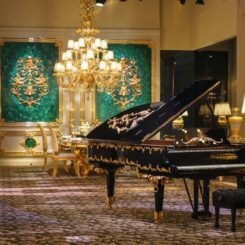 As far as furniture goes, the use of large and bulky pieces is not something to take into consideration. A much better alternative is a series of small, lightweight elements. When the color combination is simple and limited to only two or three shades, one can play with patterns. 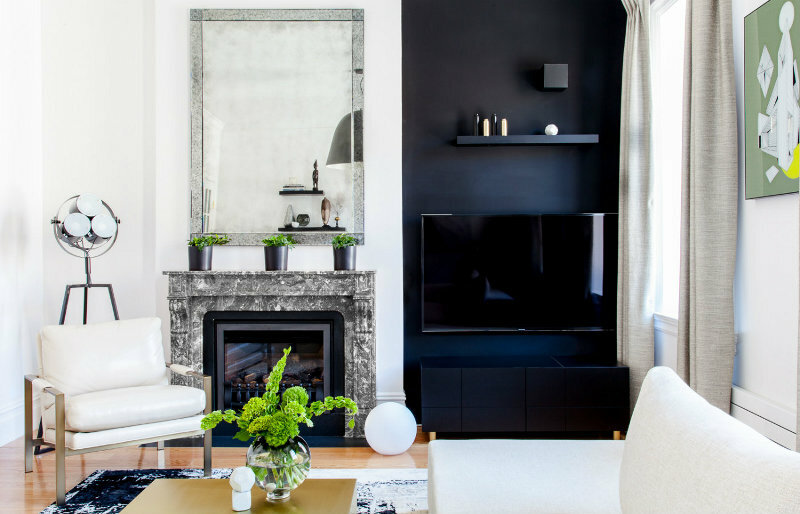 A black and white living room can be defined by a combination of geometric patterns such as stripes, chevrons and other combinations. 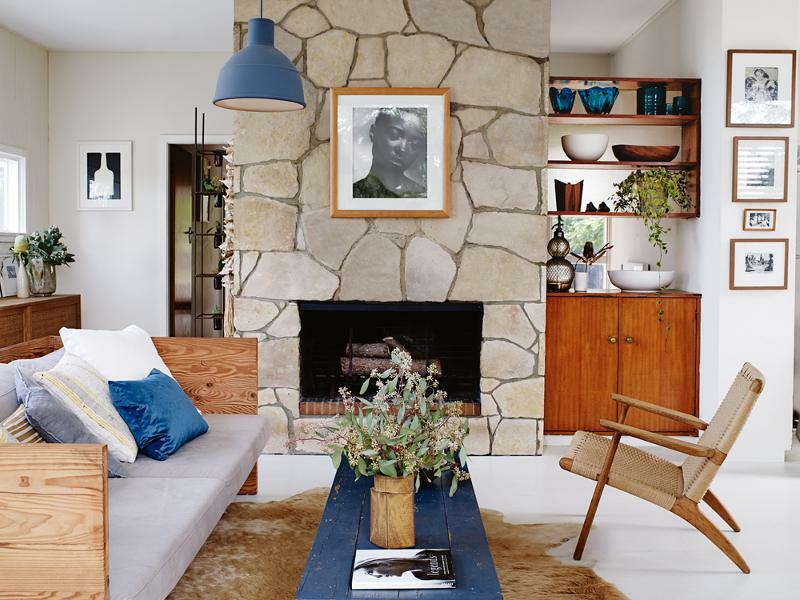 When designing this living space, Ben Pentreath wanted it to be modern and traditional as well as restful and colorful at the same time. Modern fabric and colors were layered and used in combination with antique engravings and details in order to create a décor that’s classically beautiful. 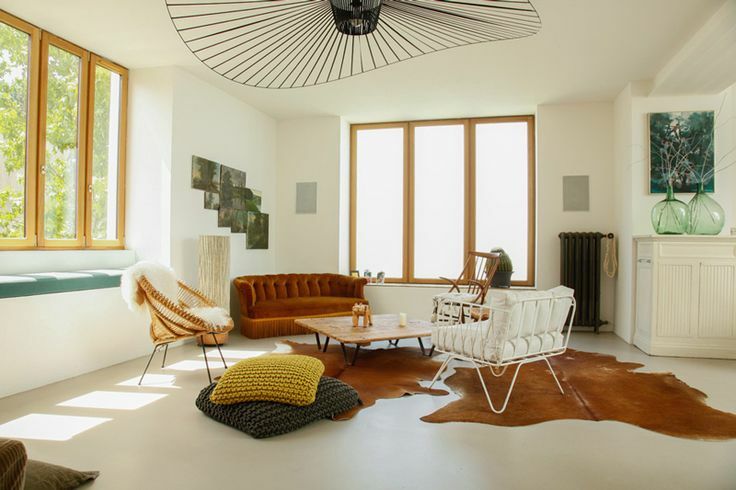 The fact that the living room designed by Nest Architects doesn’t include a sofa is hardly noticeable. 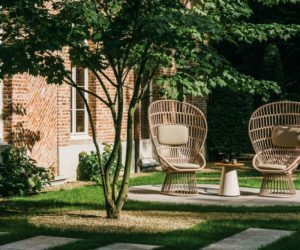 The seating arrangement includes a series of chairs and armchairs of multitude types and with distinct designs, shapes and sizes. 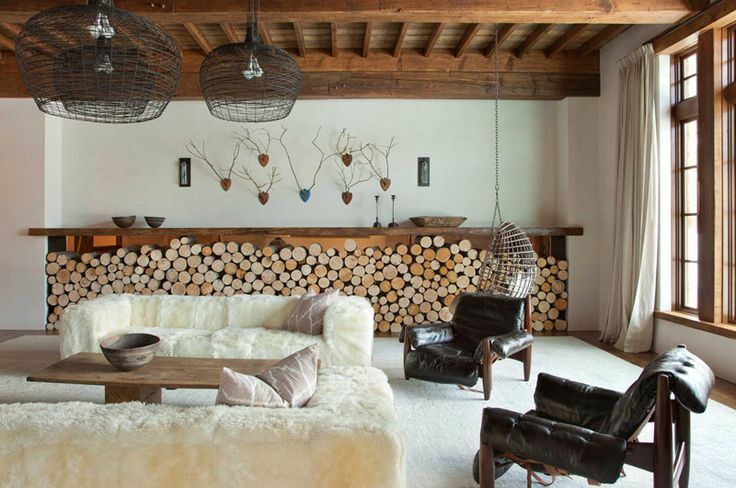 They surround a small and round coffee table positioned at the center of the room in front of a traditional fireplace. The colors used in this living room seem to come from an old, artistic picture. 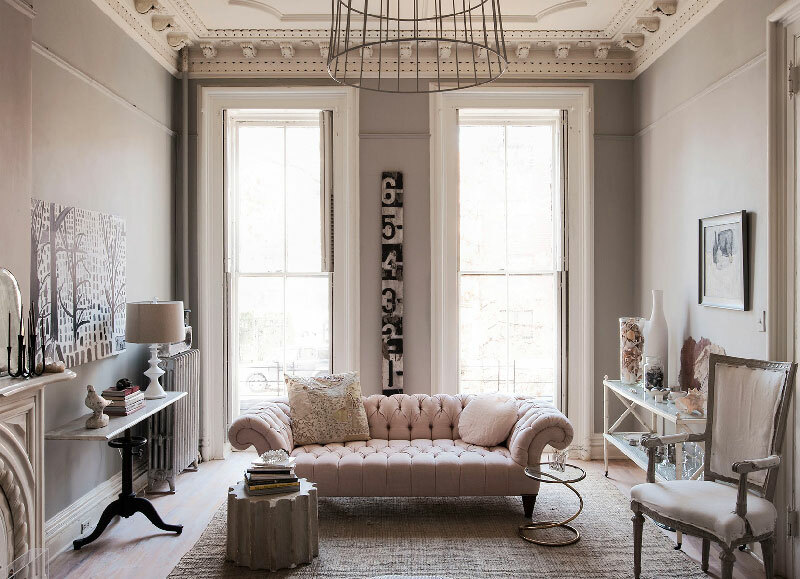 The light shades of gray which make up most of the décor are used in combination with subtle tones of beige and brown and the result is a very charming and chic interior design. 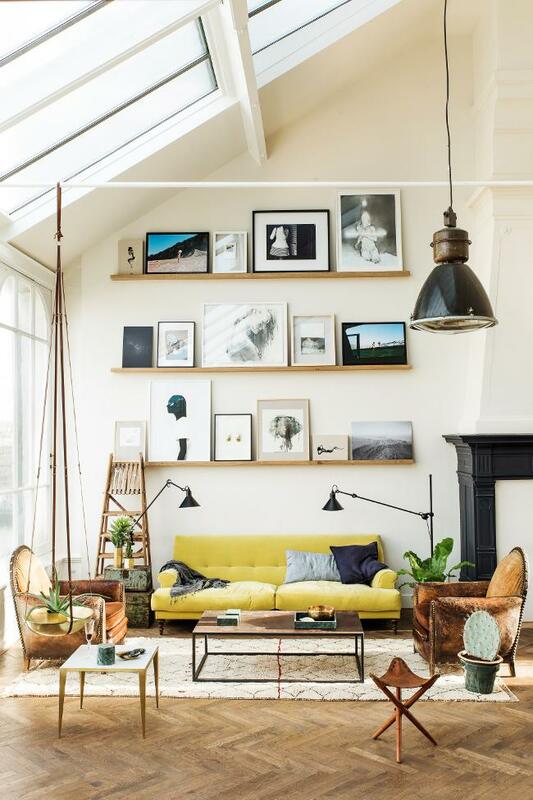 As it turns out, a gallery wall is a very valid and suitable way of making a living room look and feel complete. 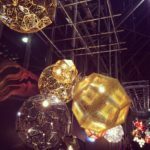 Artwork and pictures can be put together like pieces of a puzzle with various shapes and sizes to form a diversified and striking focal point. Everything else would have to be neutral and simple. 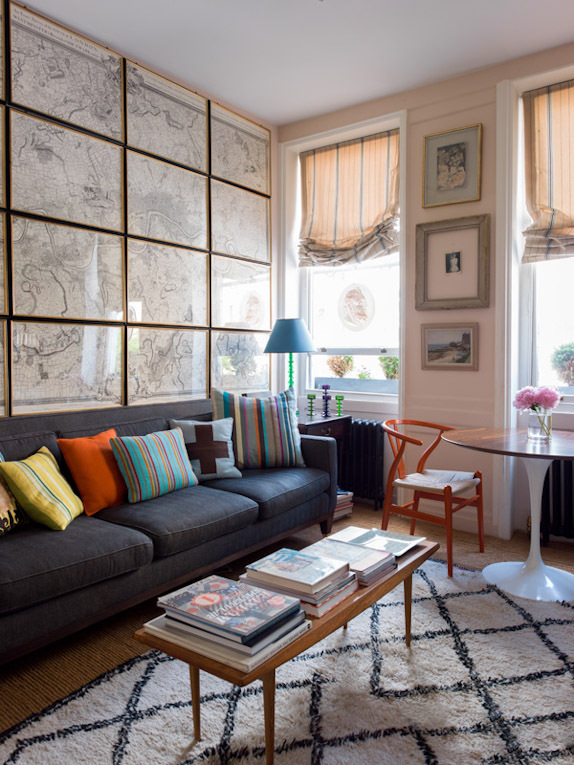 A wall which incorporates multiple windows doesn’t offer much room for furniture or so you might think. 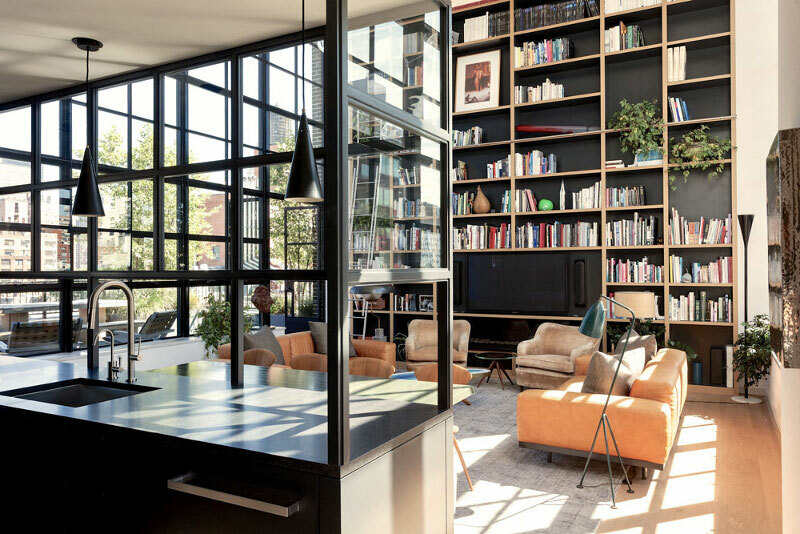 Ensemble Architecture shows how faulty that idea can be by introducing a system of bookshelves designed to frame the windows and to fit into the small spaces between and above them. A good way to save space in a small living room is with multifunctional furniture. Atticus & Milo chose for this space a coffee table with built-in storage, able to function and a small bookcase. In addition to that, more bookshelves were built on the upper portion of the wall. 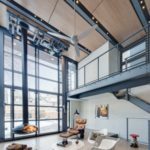 Not all living rooms have enough windows or windows that are big enough to offer them the necessary natural light they need to feel fresh and airy. An interesting idea in this case is to connect it to the adjacent room through an opening carved into the wall between them. 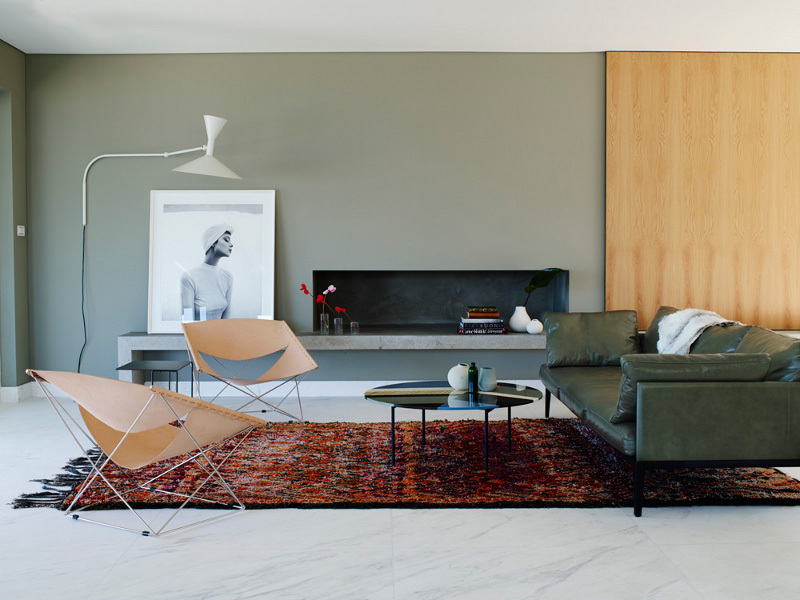 The geometry of this living room designed by Kevin Dumais is diverse and intriguing. The most eye-catching element is the live-edge coffee table with a design resembling a flower or a leaf. The spherical pendant lamp hanging above it softens the linearity of everything else in the room. 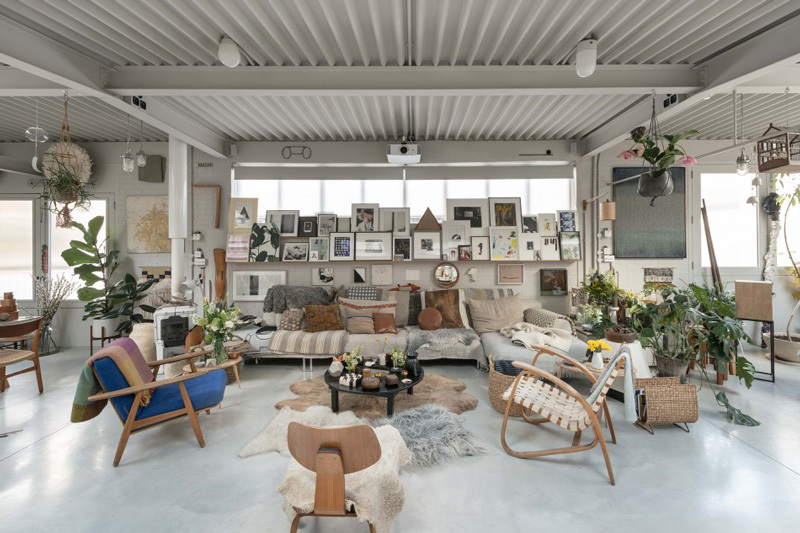 Fox Design Studio used here a combination of modern, industrial and rustic details and the result is a fresh and stylish living room which reinterprets key elements from each of the mentioned styles. 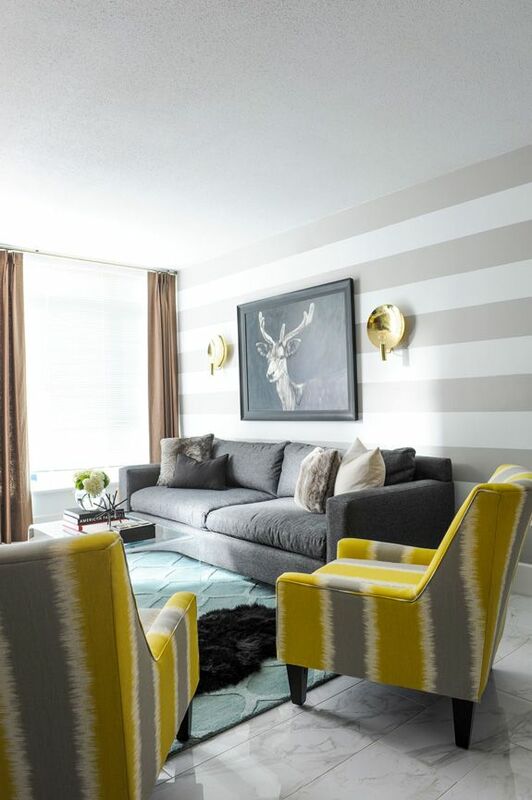 The striped accent wall offers a chic backdrop for the deer trophy artwork. 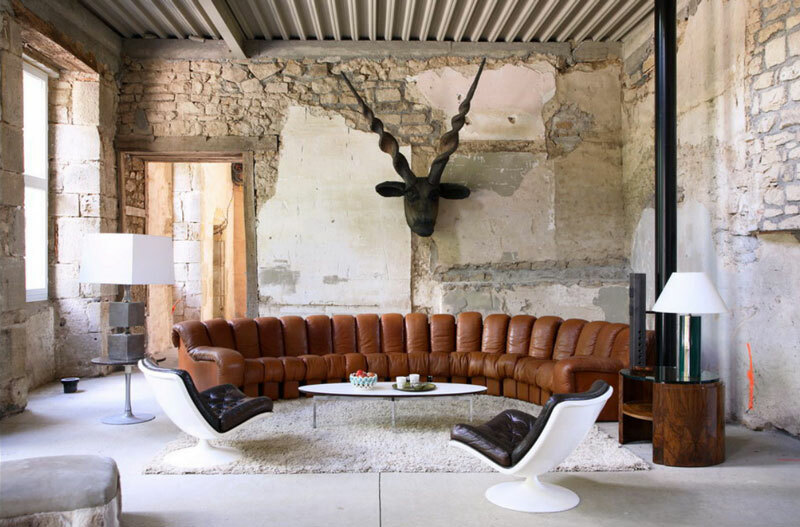 Leather furniture is timeless and always elegant. Its versatility is expressed in a multitude of designs which can adapt to traditional, modern and rustic decors. In the case of a leather sofa or bench, what matters perhaps more than the piece itself is everything else placed around it. A simple way of bringing a space closer to its natural surroundings is by linking them through a full height window or a glass wall. In addition to that, Patrick Mele also brought in the freshness of potted plants. 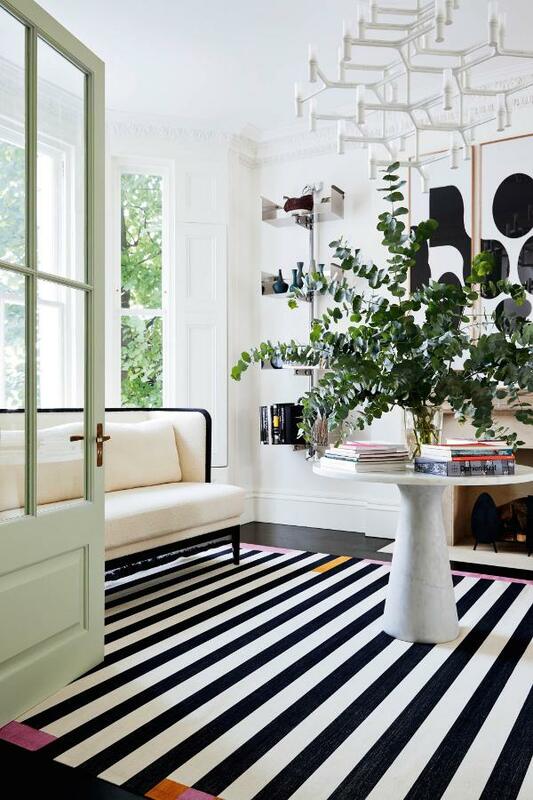 The black and white living room is a perfect shell to welcome the vibrant green beauty in. The wonderfully chic design you see here was a project by Studio DB. What we love most about it is the comfortable look and the way the robust tufted sectional sofa interacts with the Noguchi coffee table and the playful pendant lampshade. There also seems to be some very interesting artwork on one of the walls. 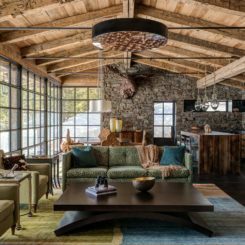 Traditional, rustic and industrial elements came together in this living room to create a unique space. 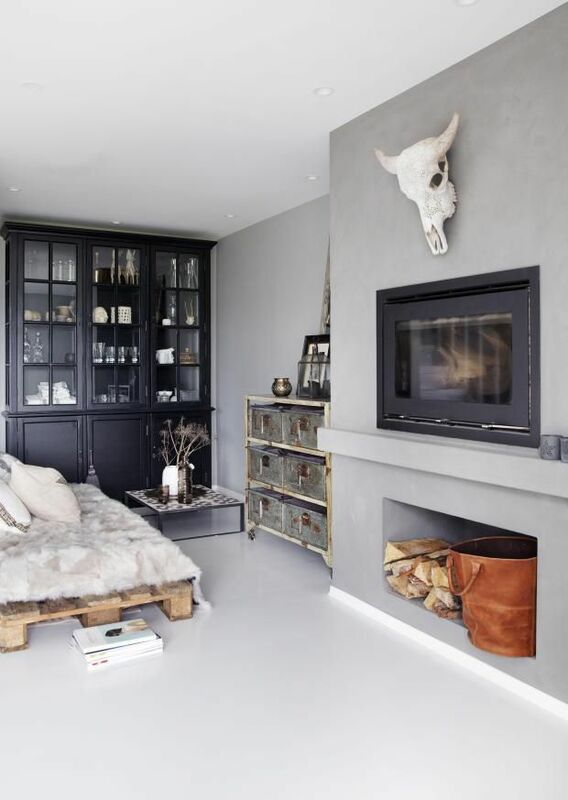 There are many interesting details worth mentioning, such as the pallet sofa frame, the distressed metal cabinet or the deceiving fireplace built into the wall, with a niche for storing firewood. The living room designed by Hector Romero makes you want to just curl up in this beautiful sofa and never leave. A palette of earthy shades was mixed here with wood accents in the form of tree stump accent table and a simplistic cabinet. Vibrant and flamboyant, this living room puts together the timeless combo of black and white, the complementary yellow and blue tones and a few unexpected features such as the animal print accent pillow or the turquoise vase. 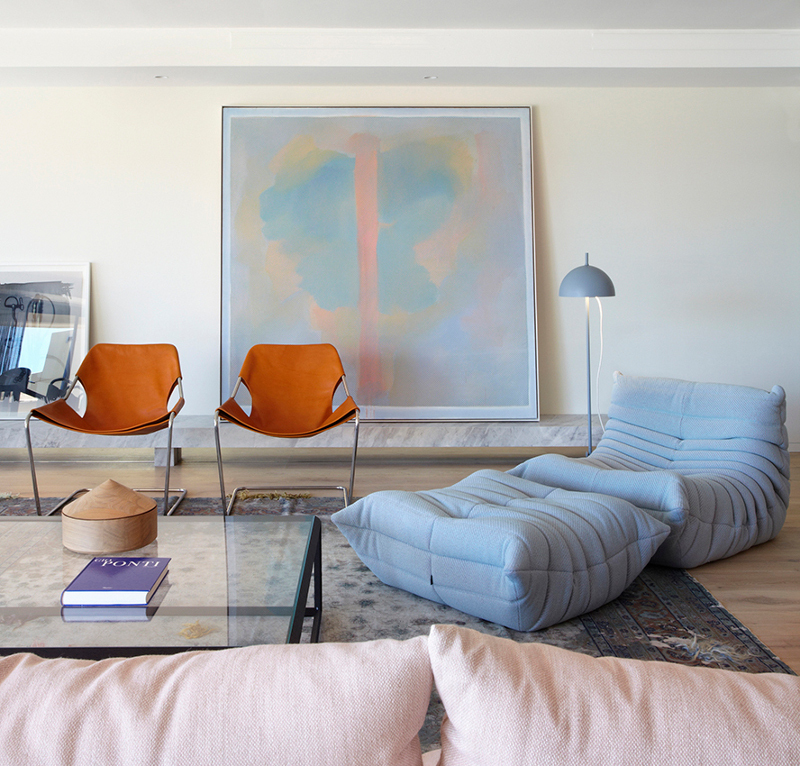 We find this living room designed by Ashe + Leandro to be inspiring in many ways. The high ceiling offers the room grandeur and the choice of furniture both grounds the space and makes it feel casual and relaxed. 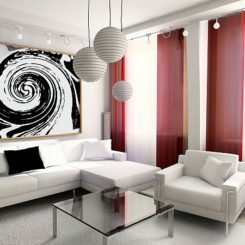 At the same time, the diverse framed artwork displayed on the wall and the small touch of red give the room character. The larger the number of accessories and decorations included in a room’s interior design, the harder it is to maintain the balance and to make the space feel welcoming. This, for example, is a living room which incorporates a multitude of diverse elements, each adding a unique touch to the décor. Decorating and furnishing the corners of a living room is often challenging. Each home is different and this means custom solutions have to be found. Perhaps you can find some inspiration in this image showing a very charming design built around an accent chair. Some find interior designs such as this one to be overly complicated, cluttered and disturbing. Others, on the other hand, find it relaxing and comfortable, enjoying the diversity of elements and the unusual harmony that’s established throughout. 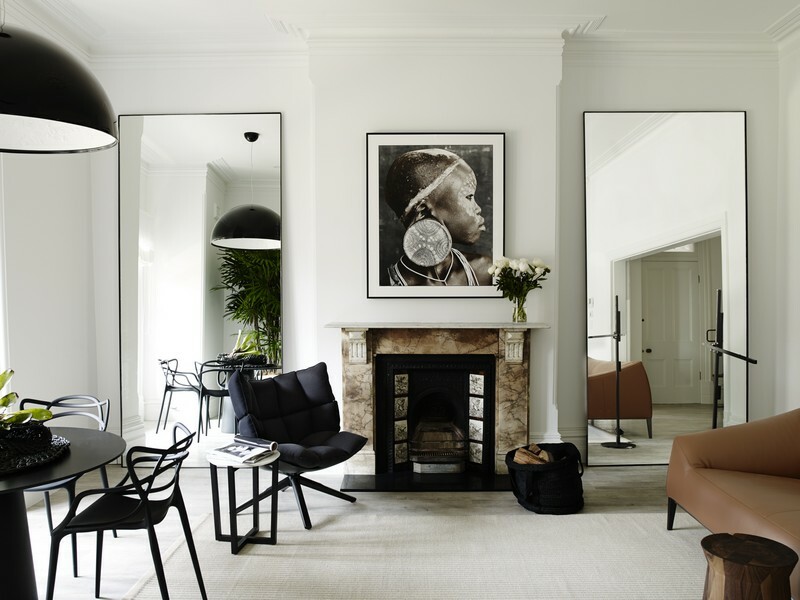 Every living room needs a dose of personality which is given in this case by Chango & Co through elements such as an unexpectedly playful piece of artwork on the fireplace mantel, a pair of oversized mirrors and a funky chandelier resembling a dandelion.